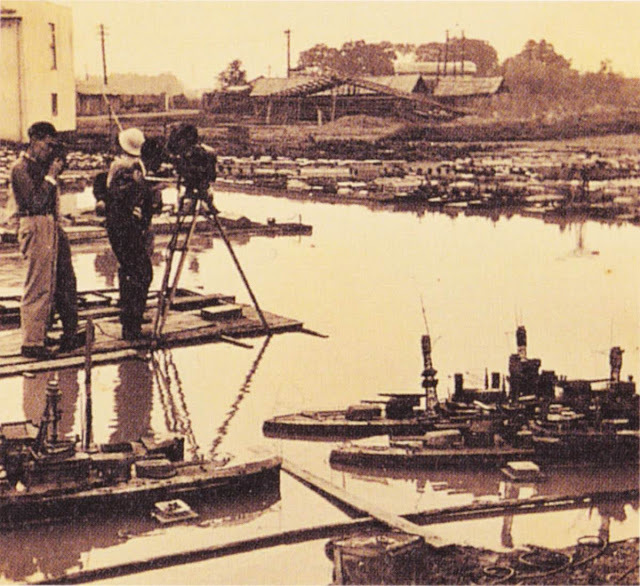 Received an award for visual effects from the Japan Motion Picture Cinematographers Association. 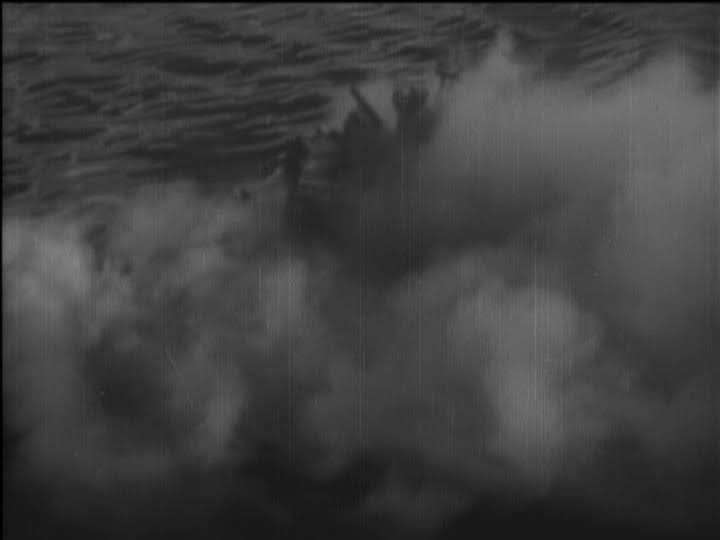 Eiji Tsubaraya was predominantly known in the west for the visual effects of the Japanese giant monster pictures or Kaiju starting with Godzilla in 1954. Not so commonly known , having mostly only been seen in Japan, is his contribution to a series of war pictures. 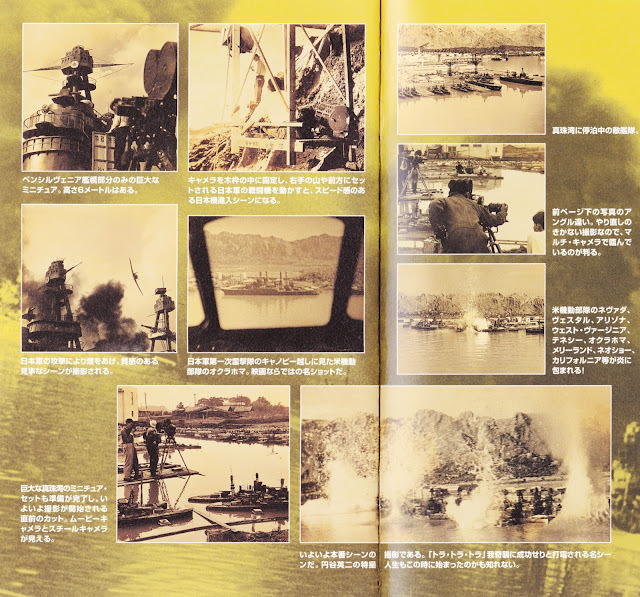 This, one of the earliest, depicts the Japanese attack on Pearl Harbor as well as a few other Japanese imperial navy victories between 1941 and 1942. 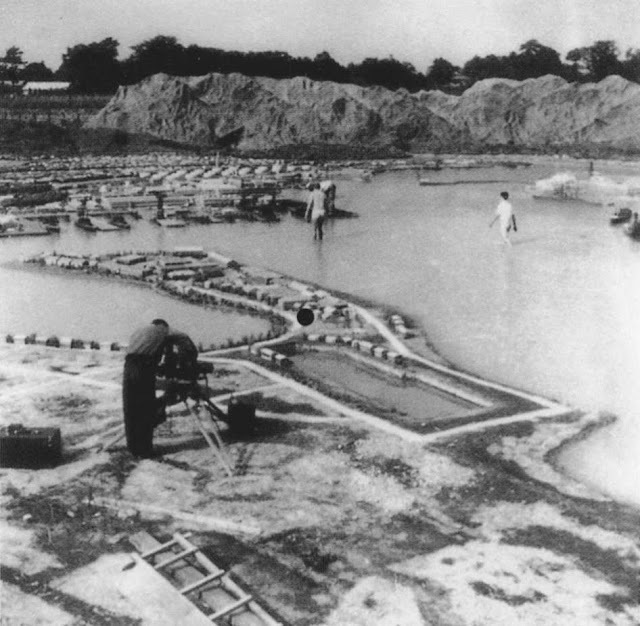 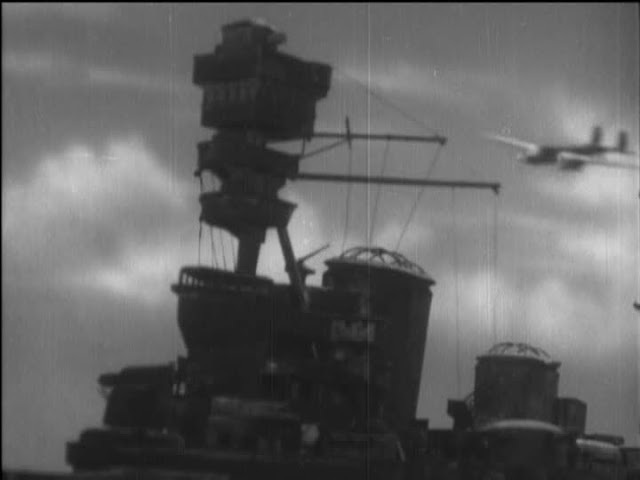 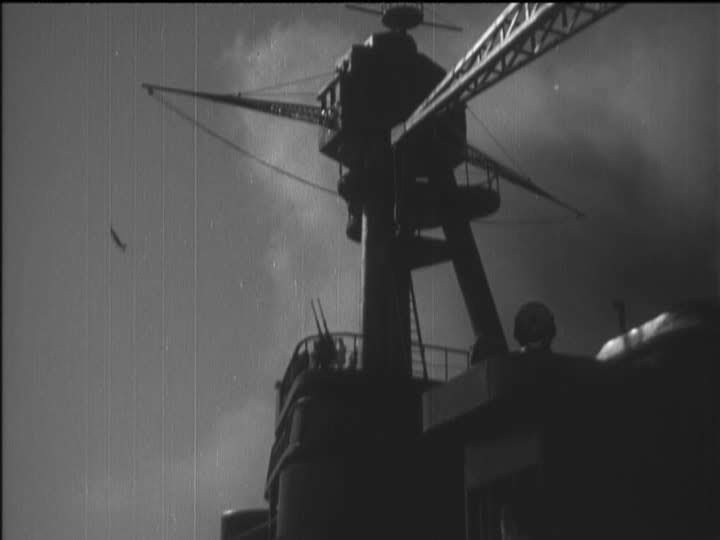 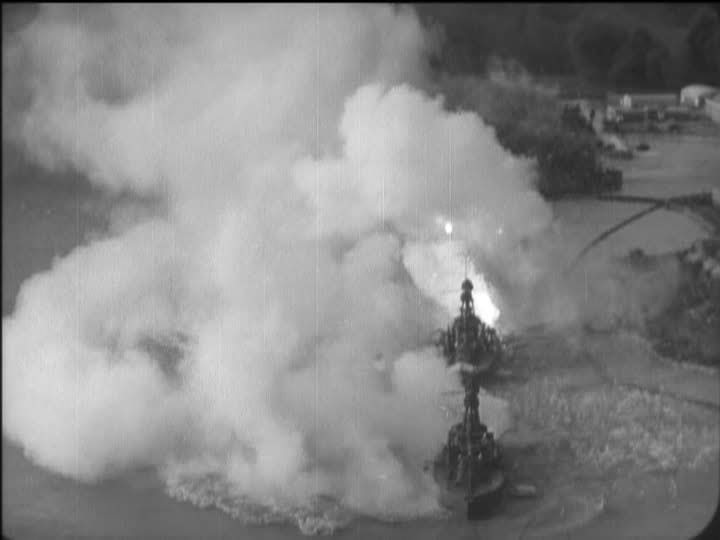 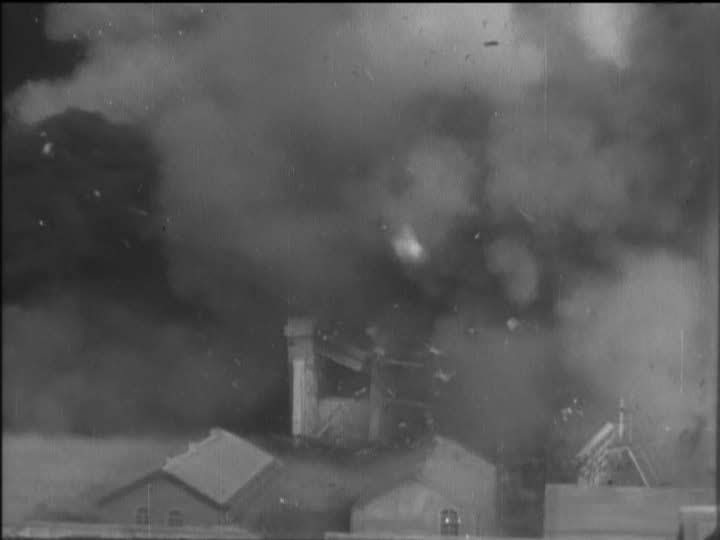 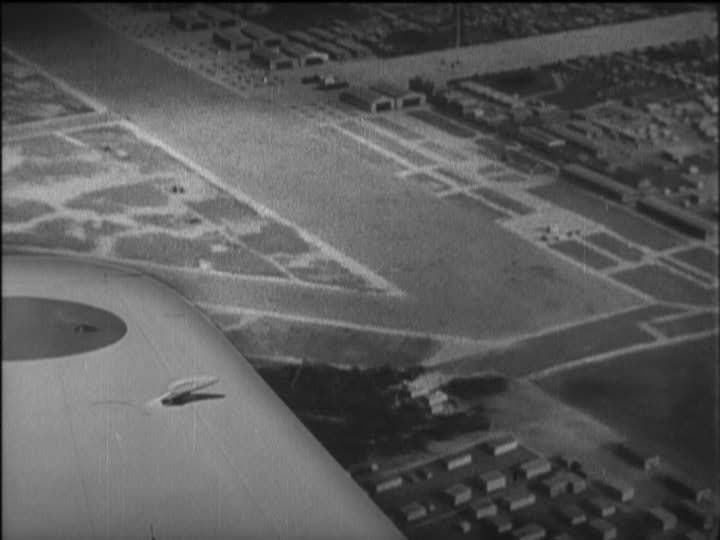 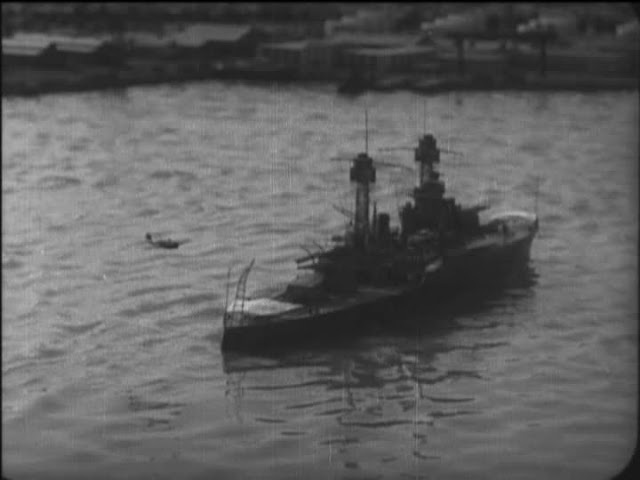 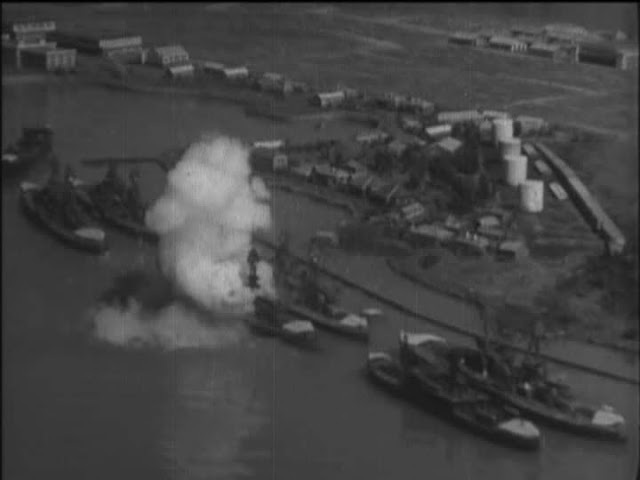 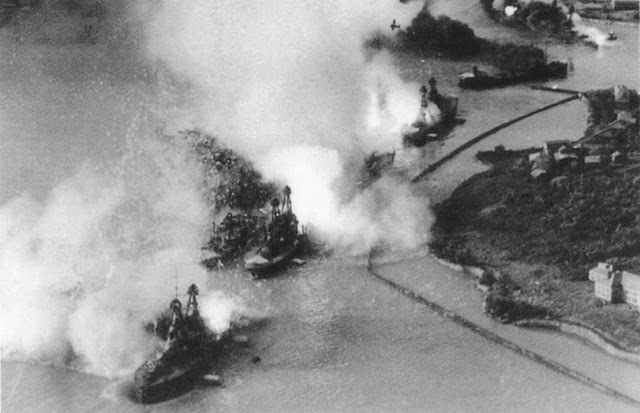 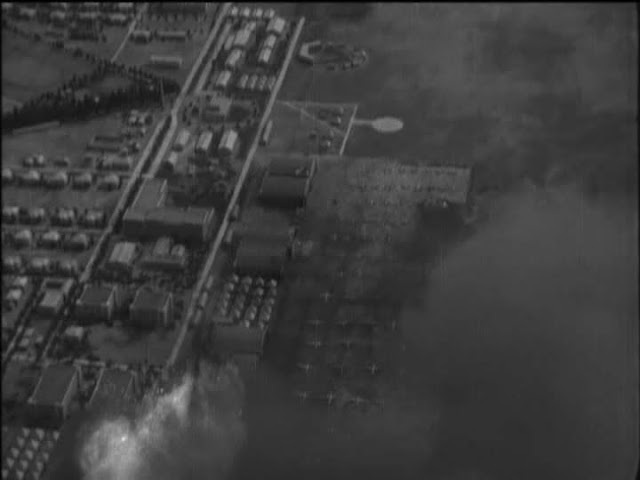 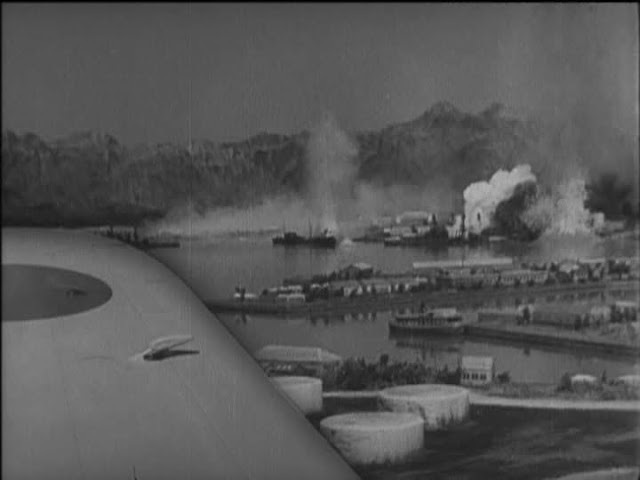 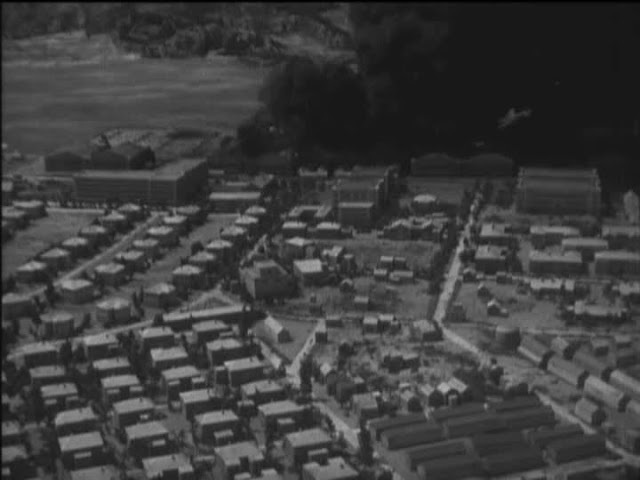 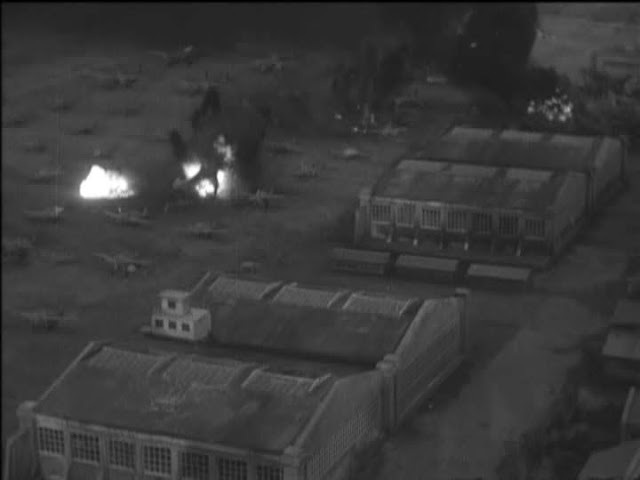 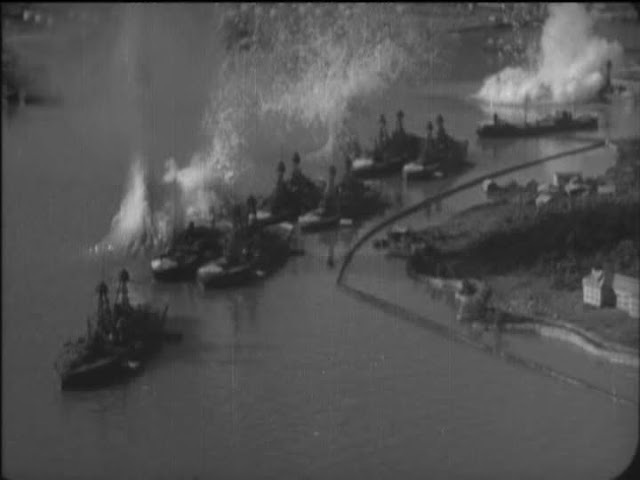 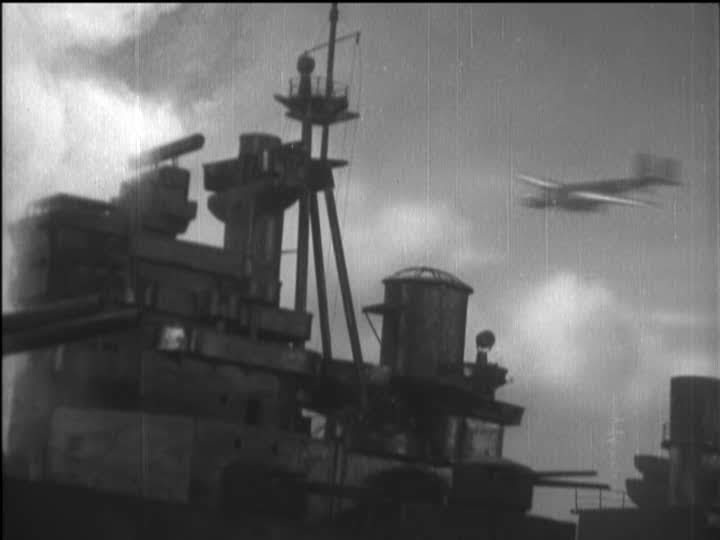 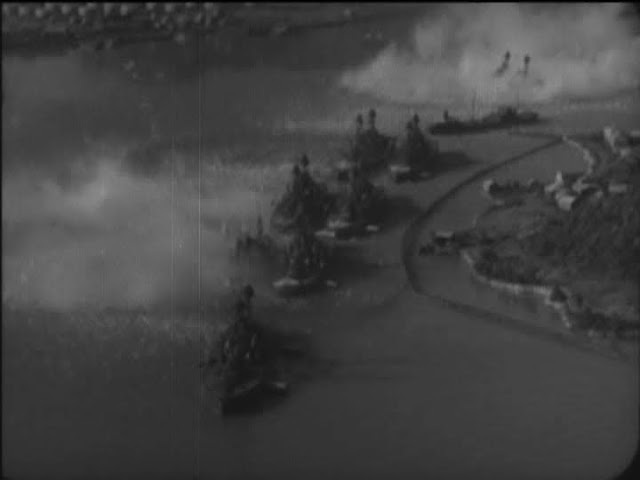 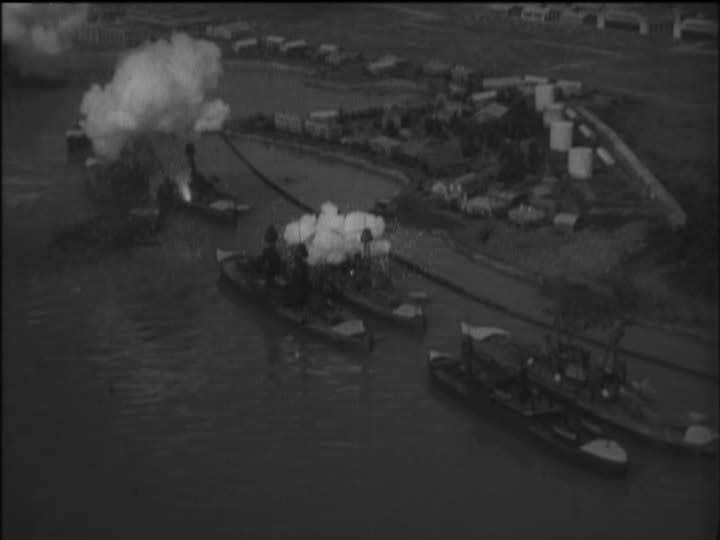 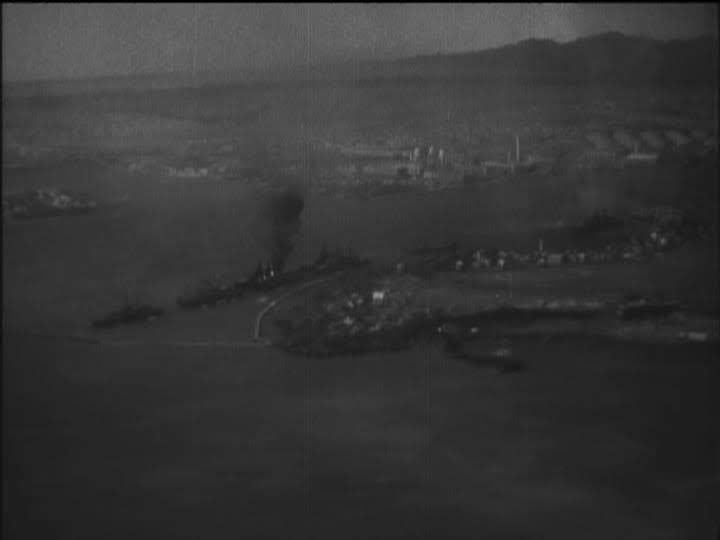 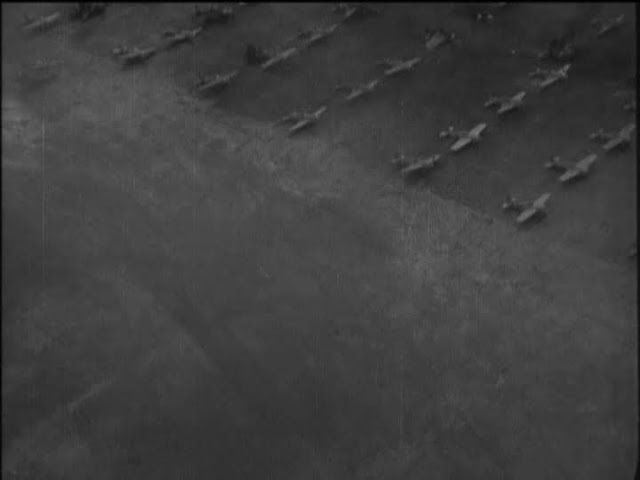 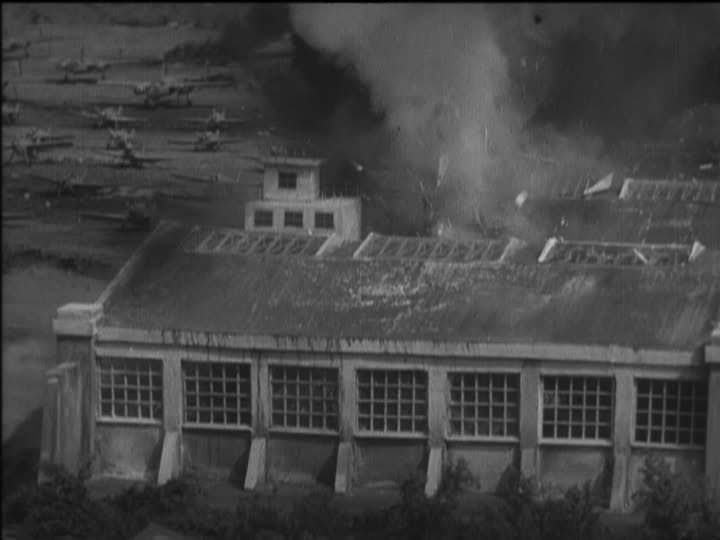 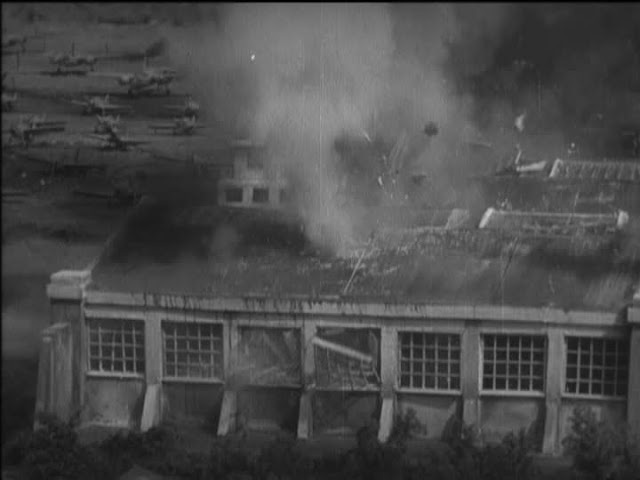 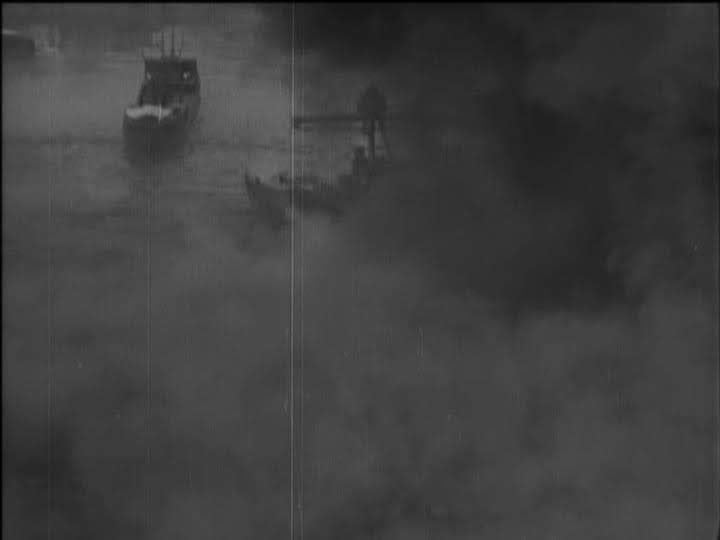 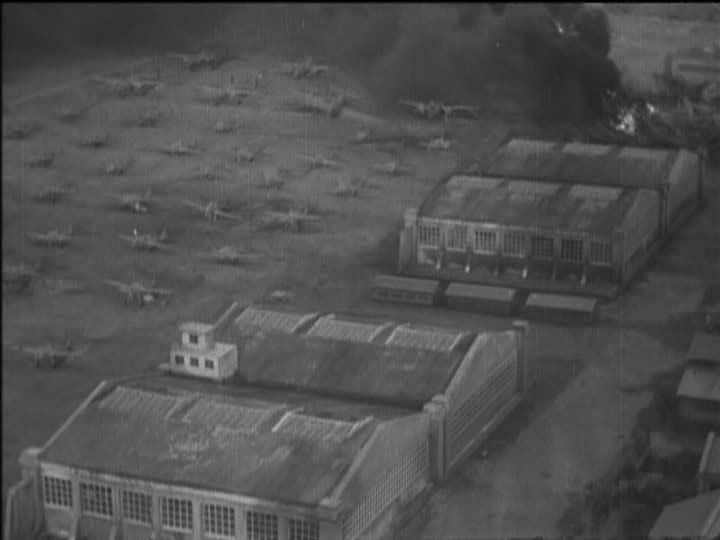 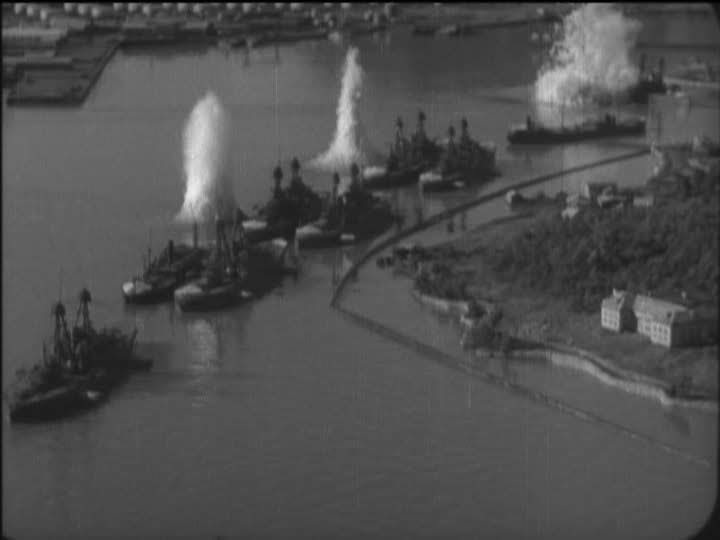 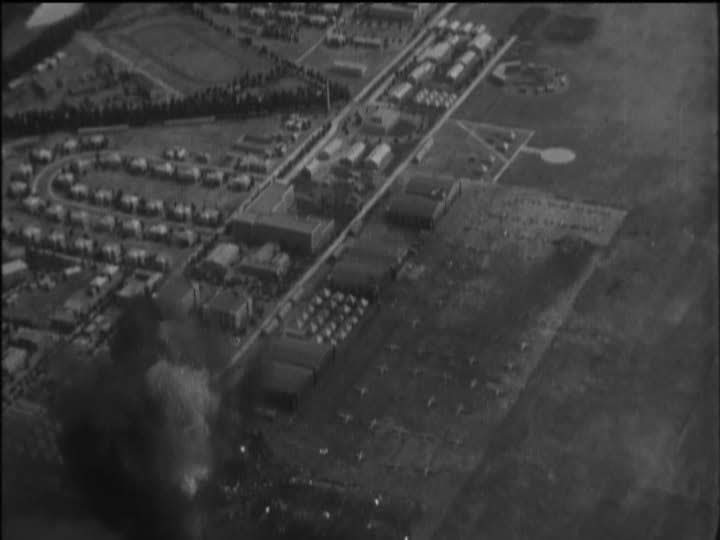 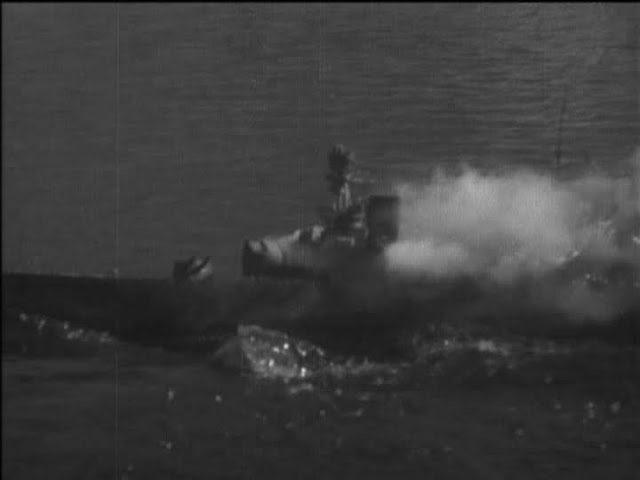 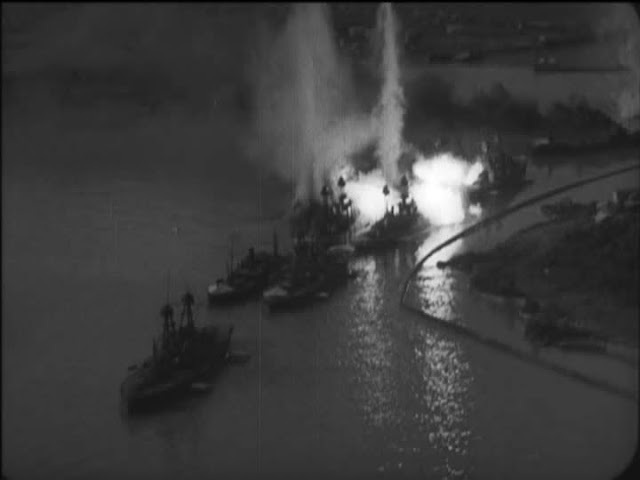 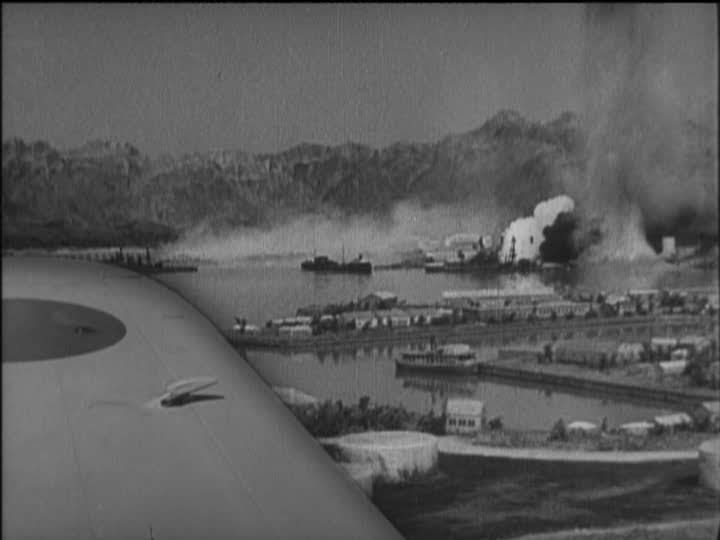 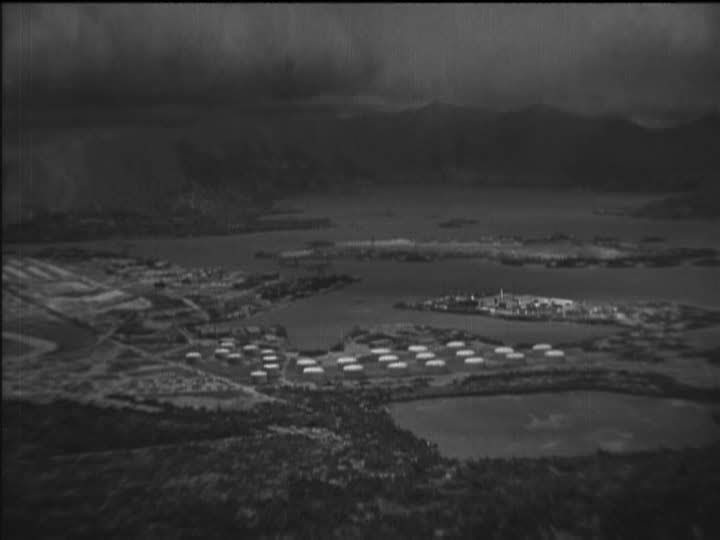 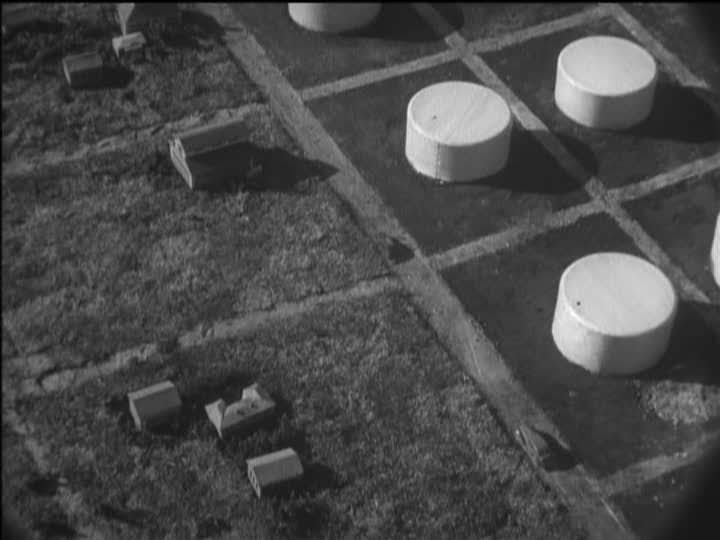 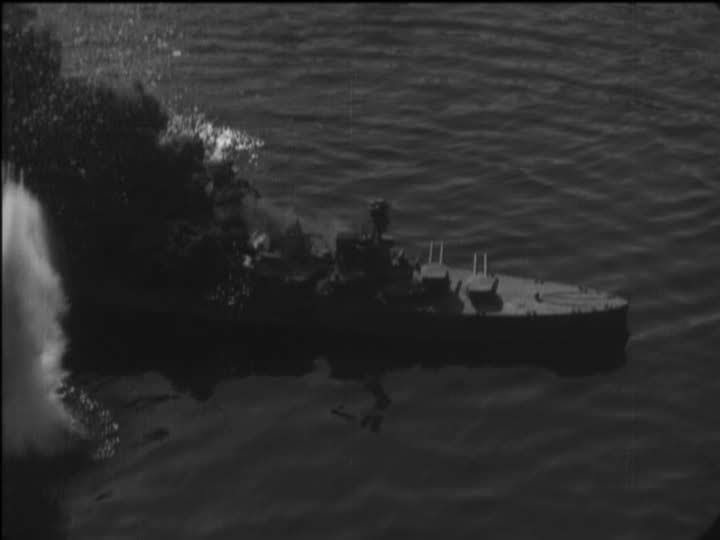 Using Naval aerial photographs the effects team built an accurate large expanse of miniature set, outdoors, with buildings, hangars, moving trucks, vehicles and attacking aircraft as well as many American warship models. 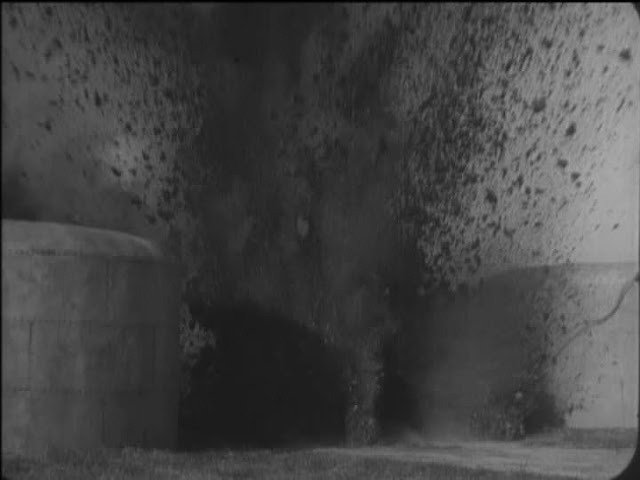 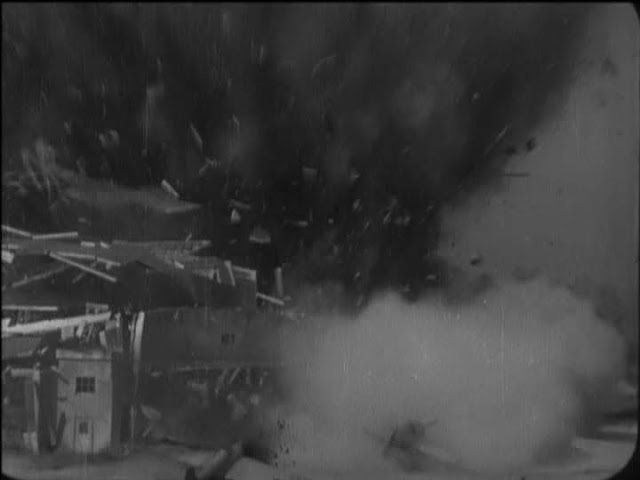 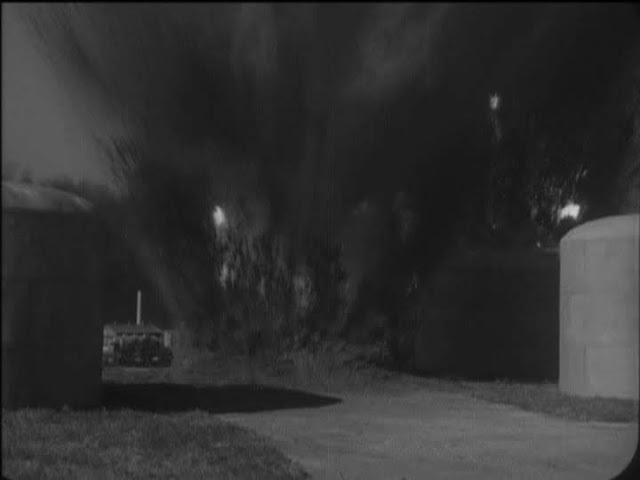 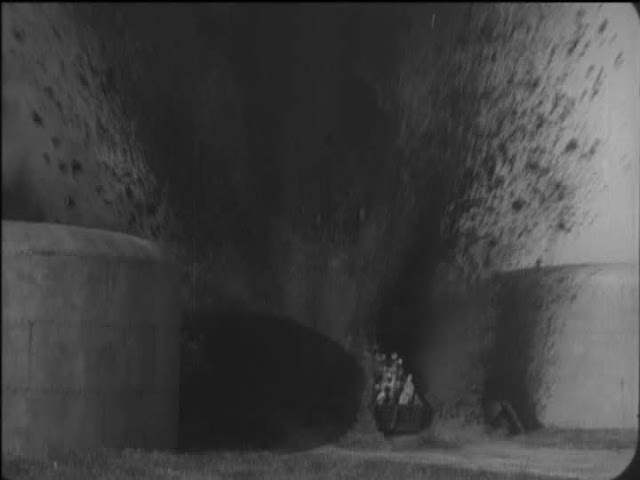 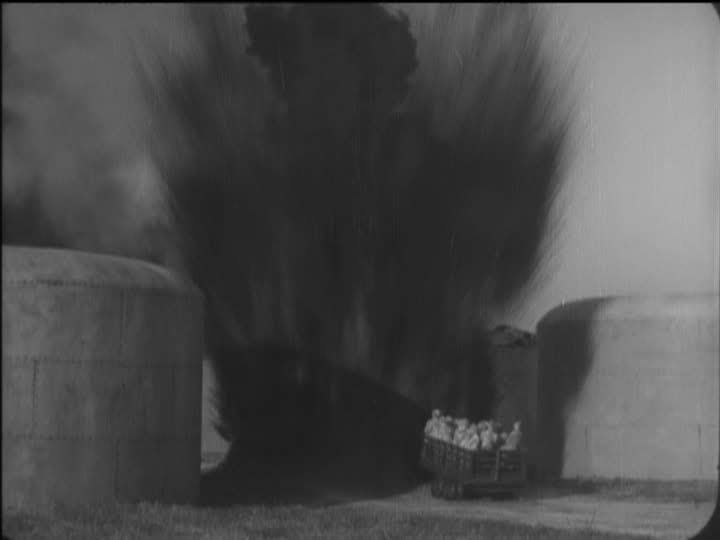 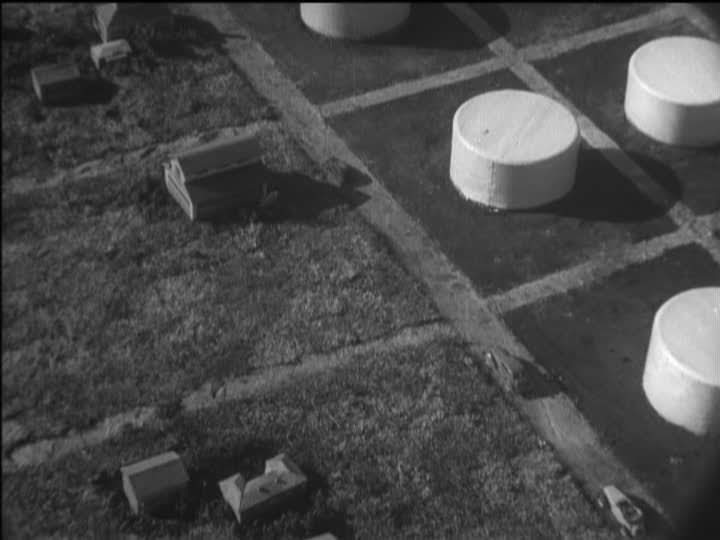 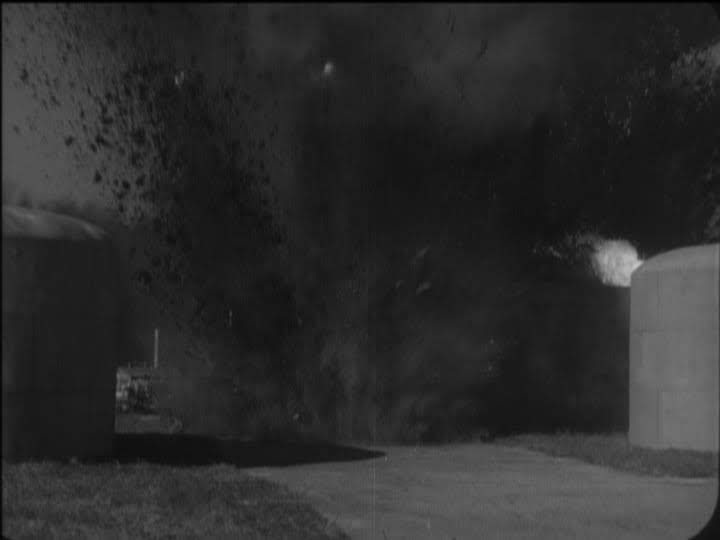 They then proceeded to destroy the whole lot by blowing it up in shot after shot. 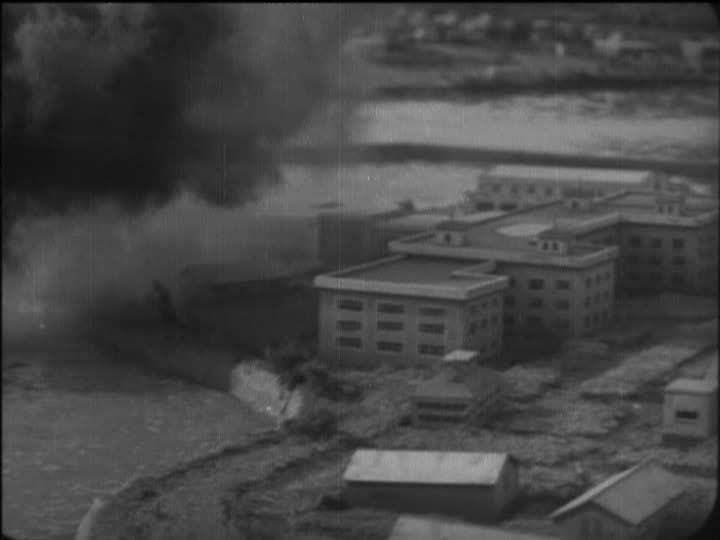 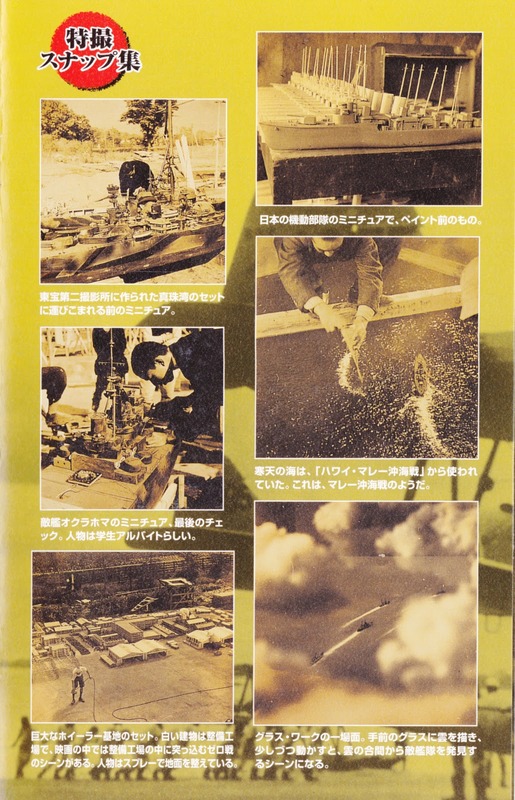 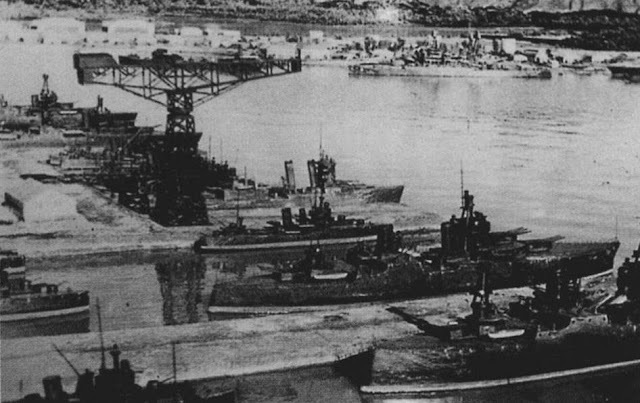 There is a legend that the American occupying forces took the miniature work for real and in fact they believed Tsubaraya must have been part of a spy network to have access to such accurate information. 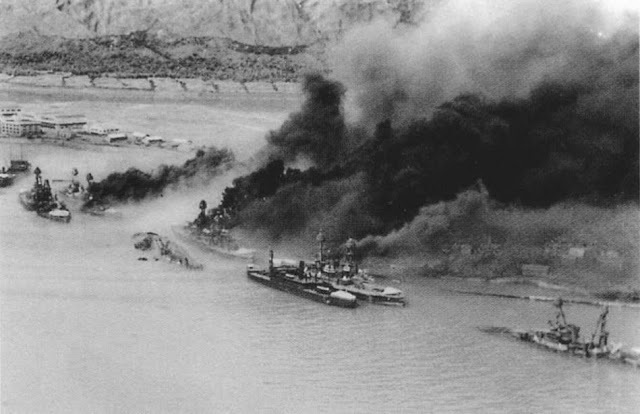 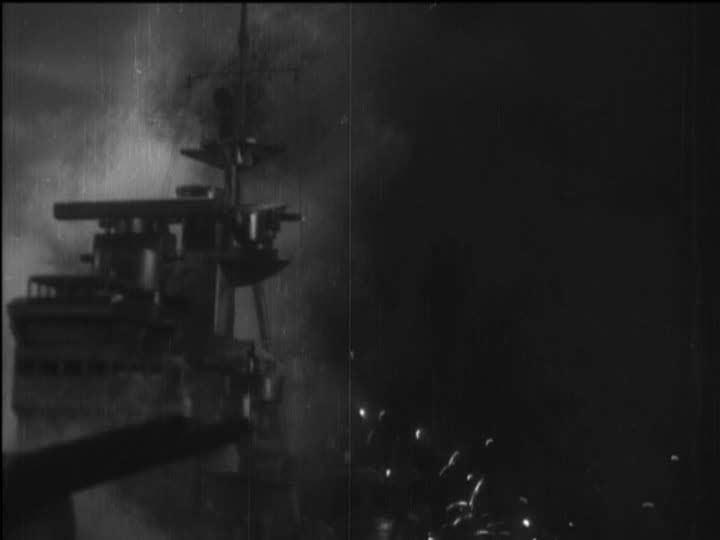 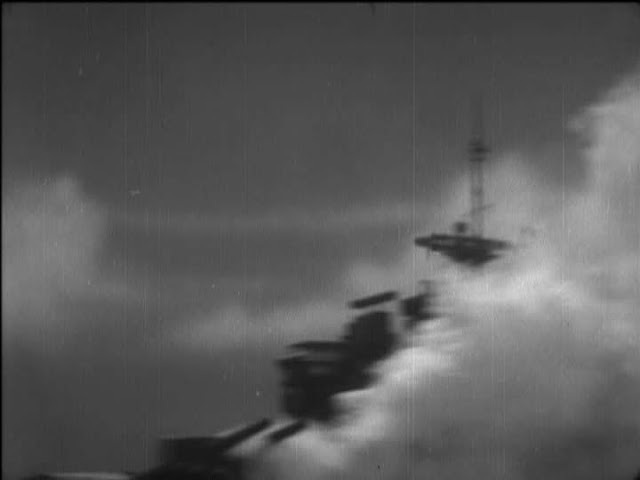 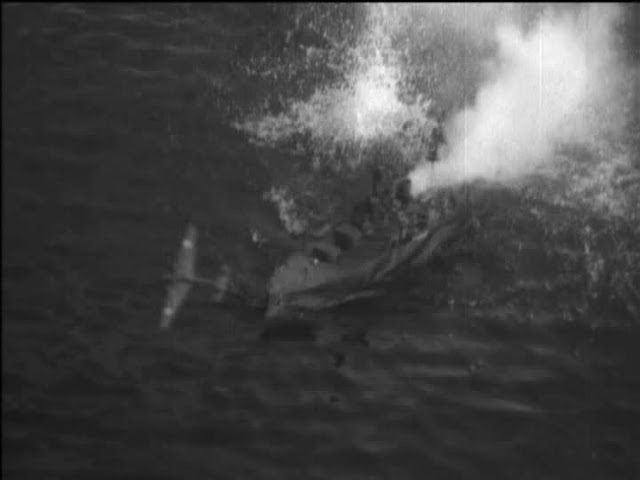 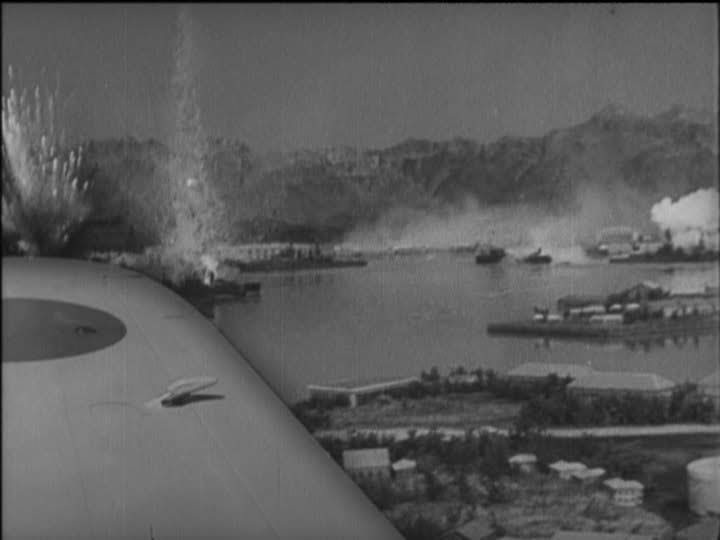 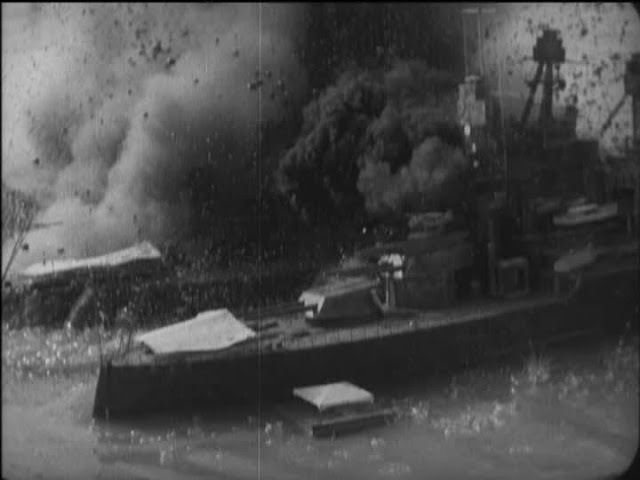 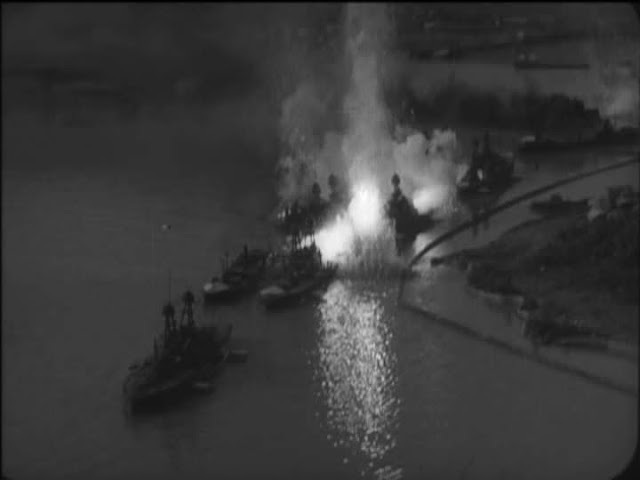 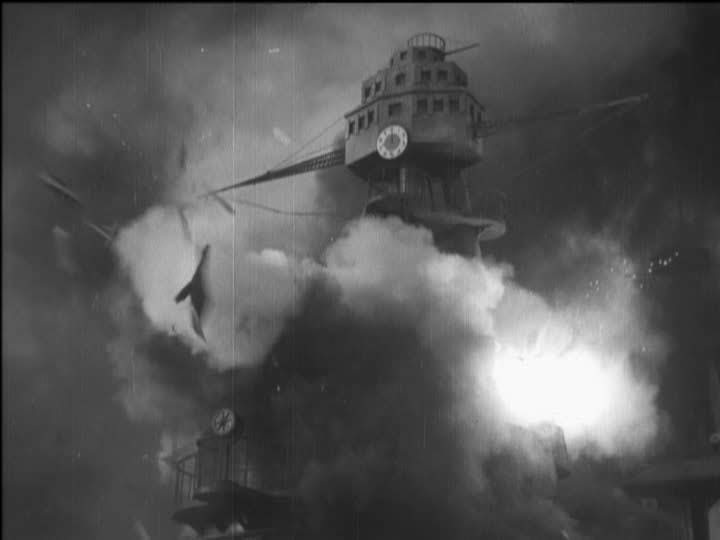 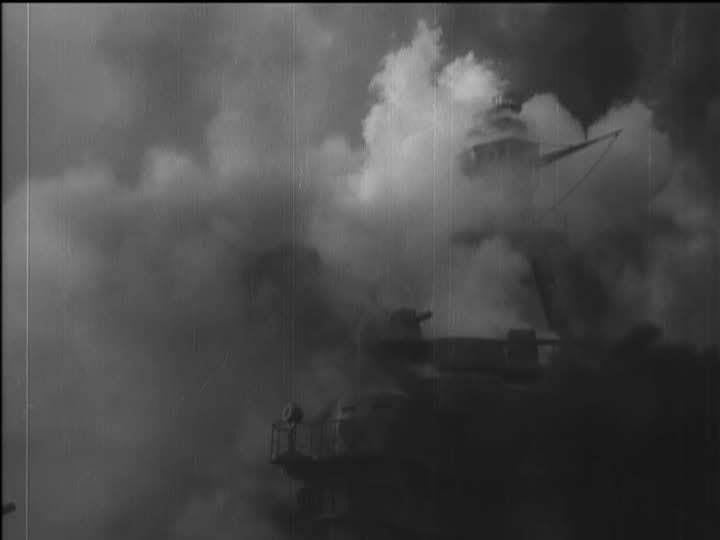 Compared to real footage of the Pearl Harbor attack it doesn't really hold up but there are a number of particularly effective shots. 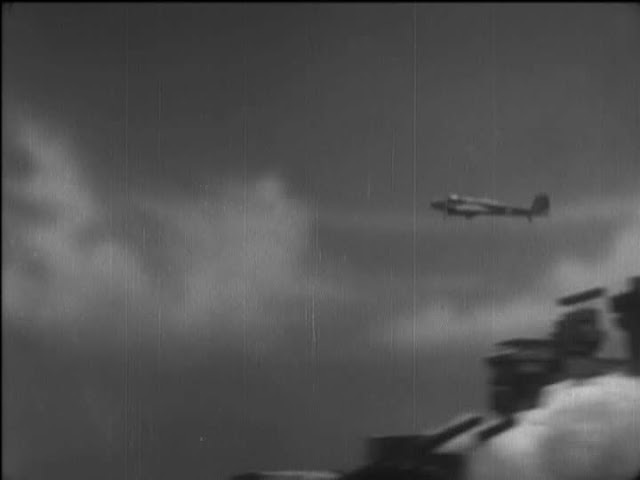 The camera is often shooting from the point of view of an aircraft in flight and the motion is really well simulated and quite convincing. 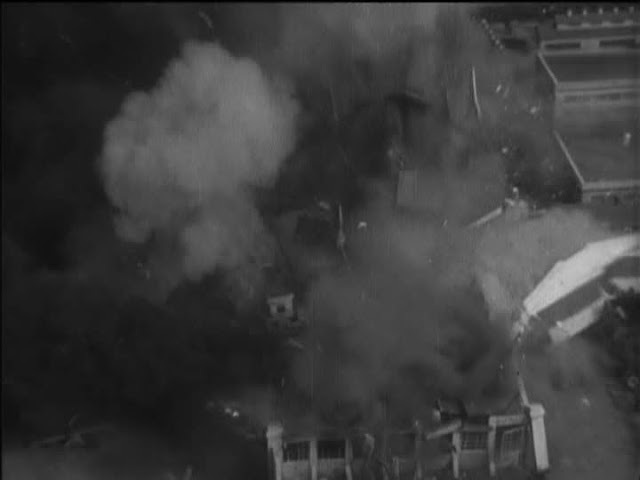 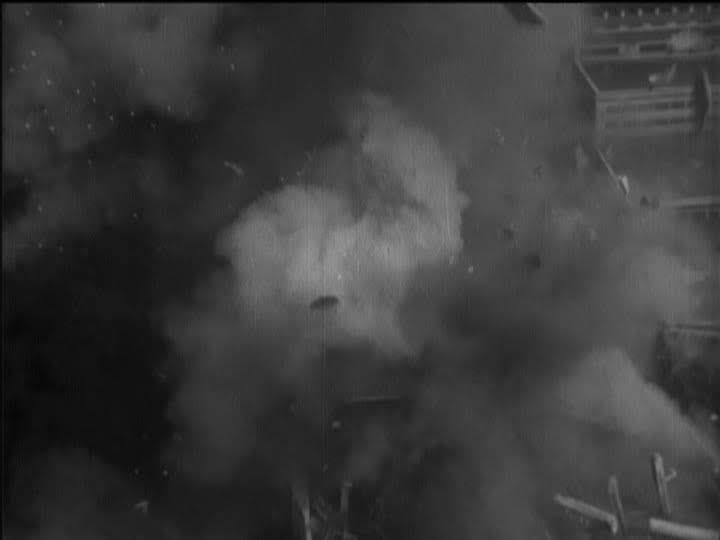 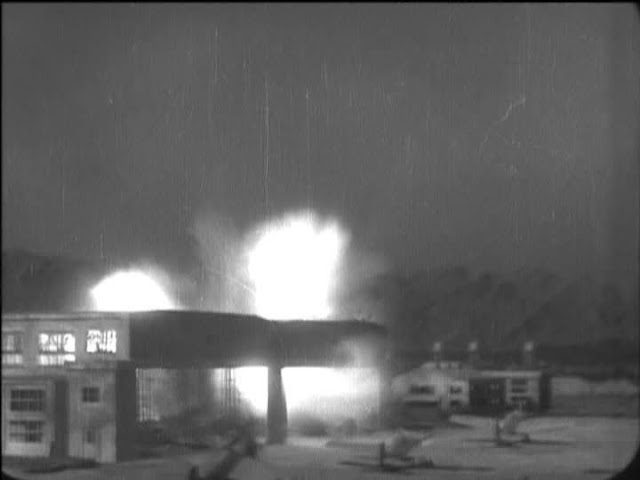 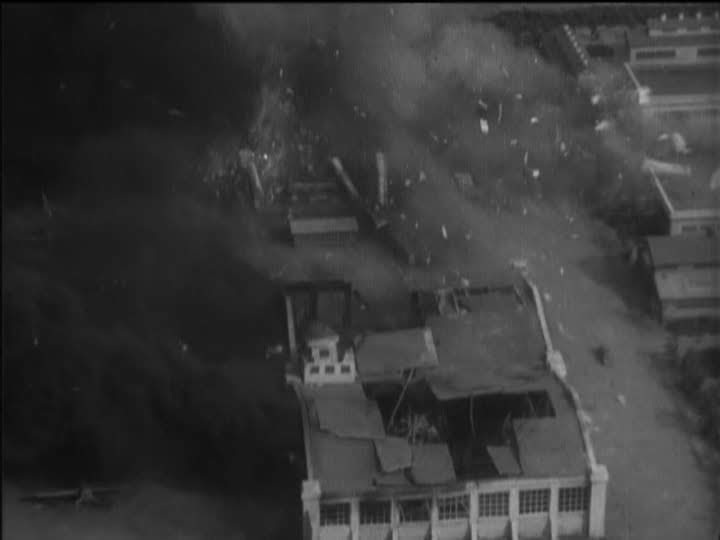 Some of the buildings being blown up also fracture and collapse really well. 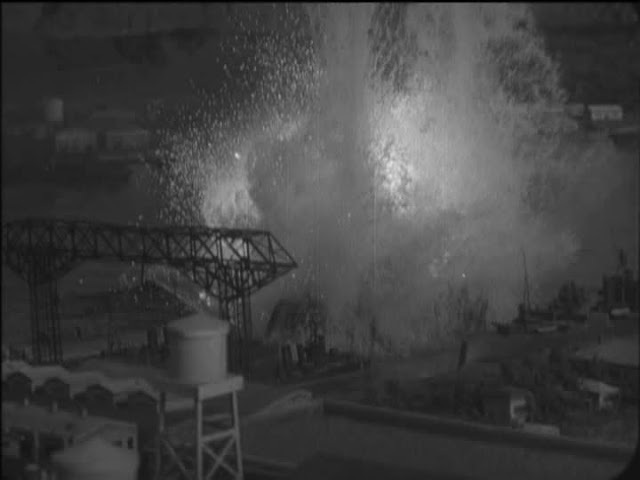 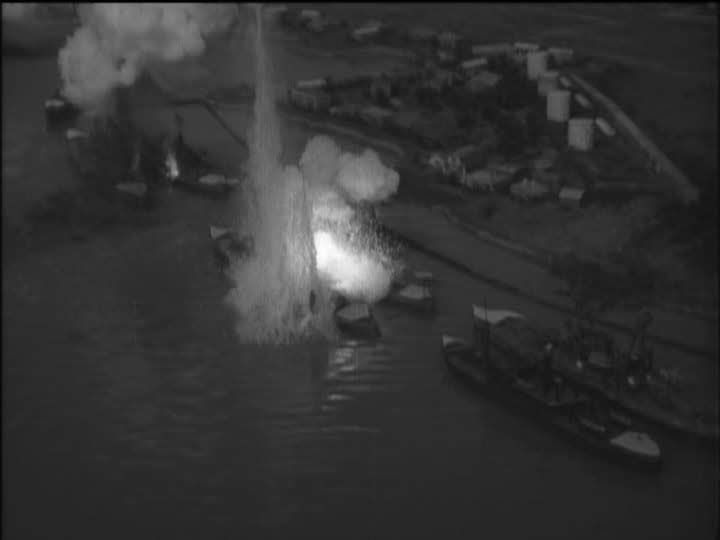 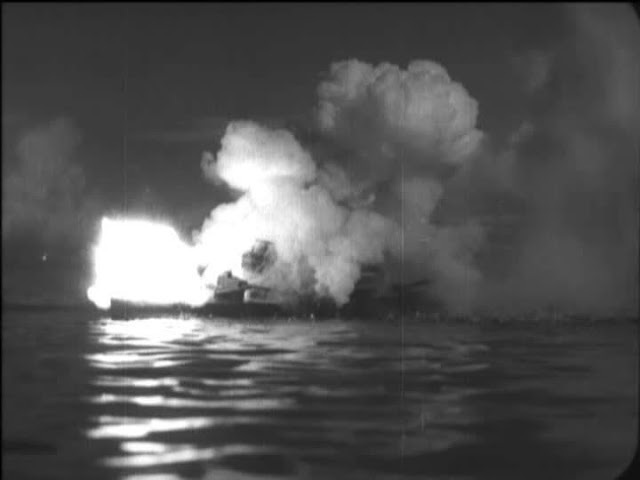 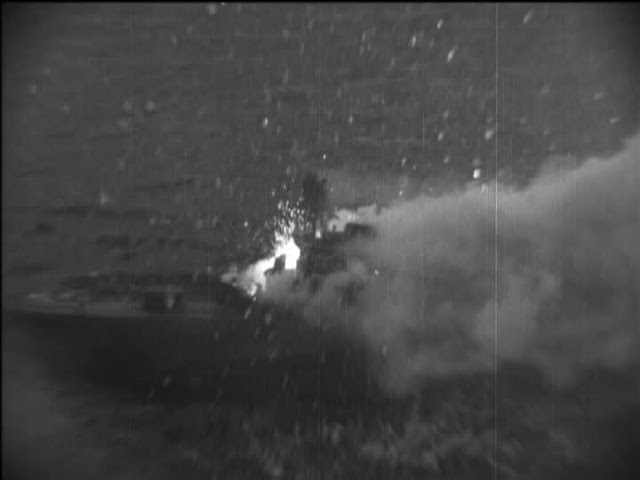 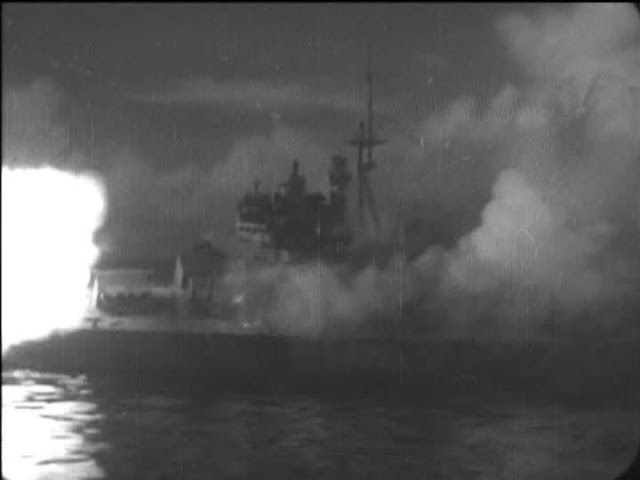 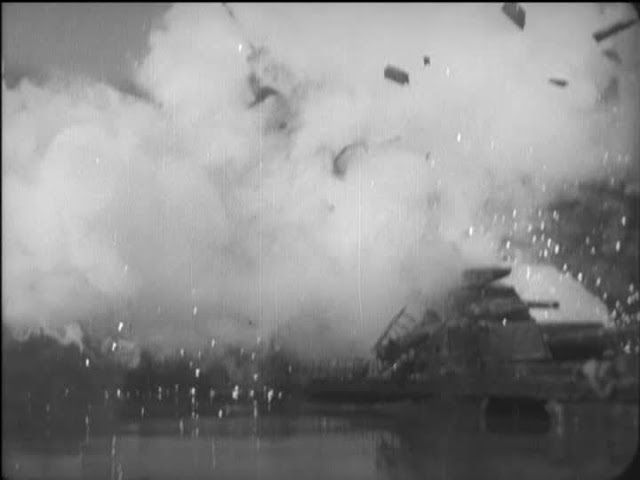 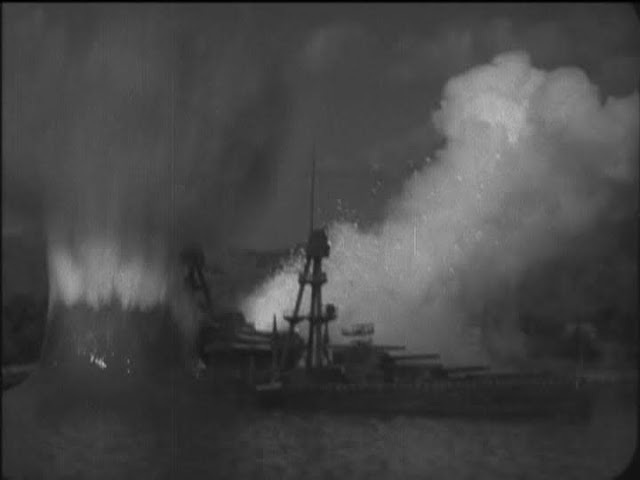 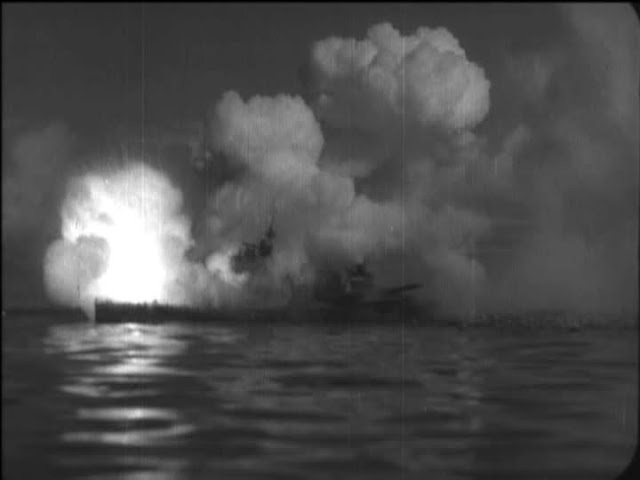 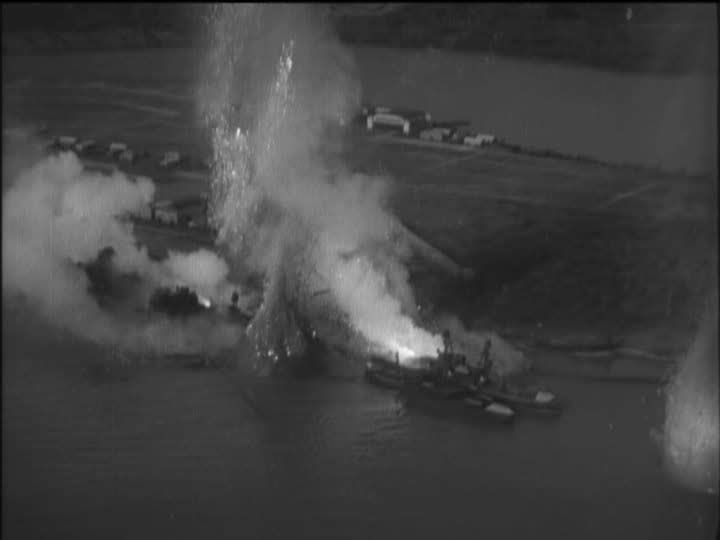 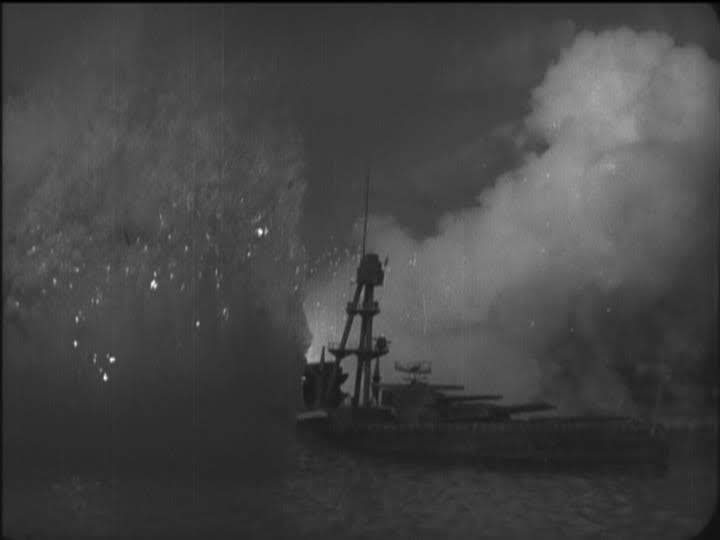 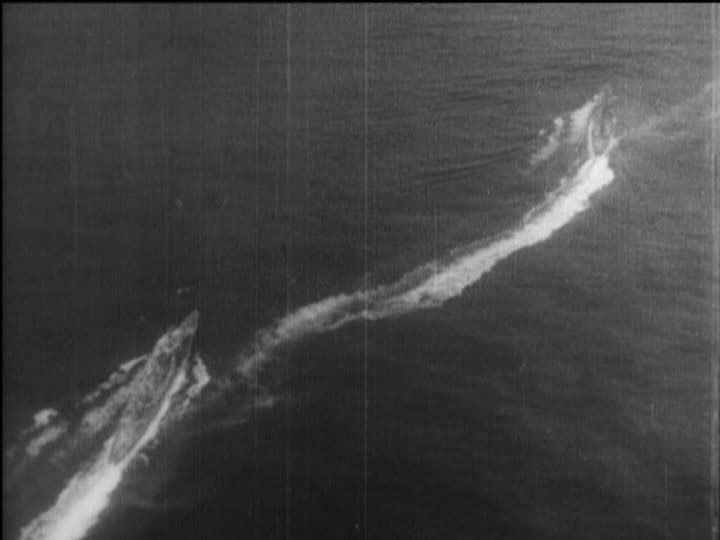 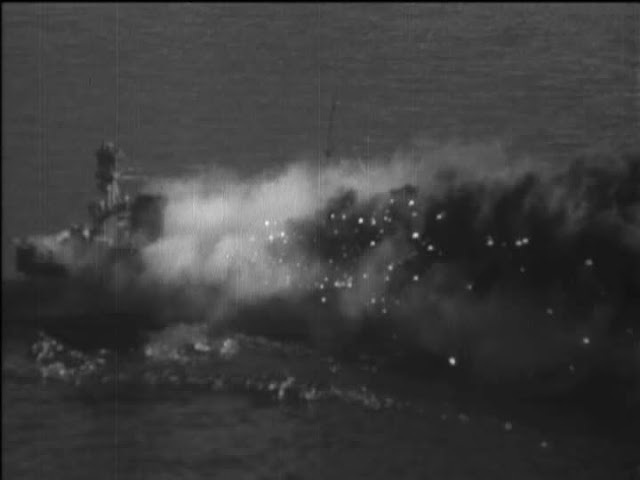 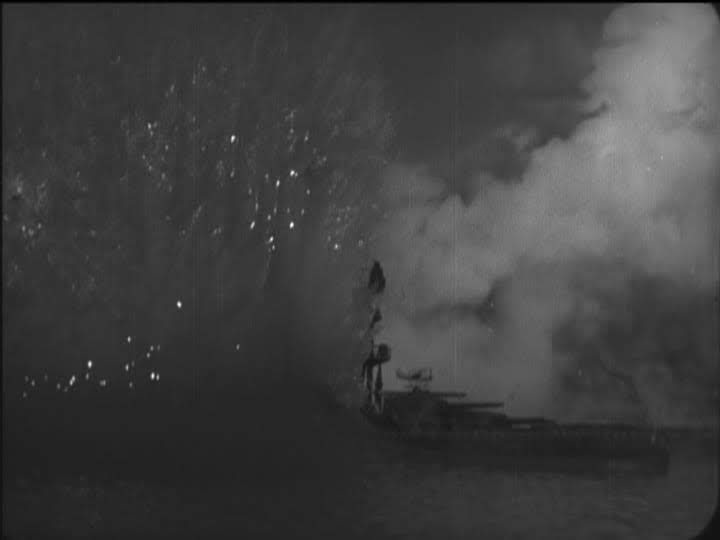 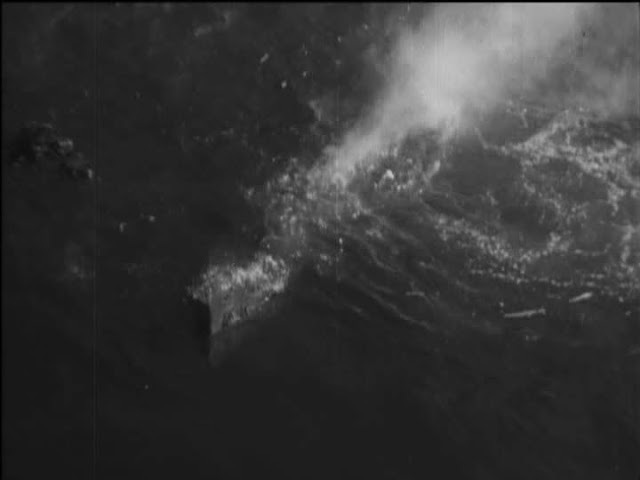 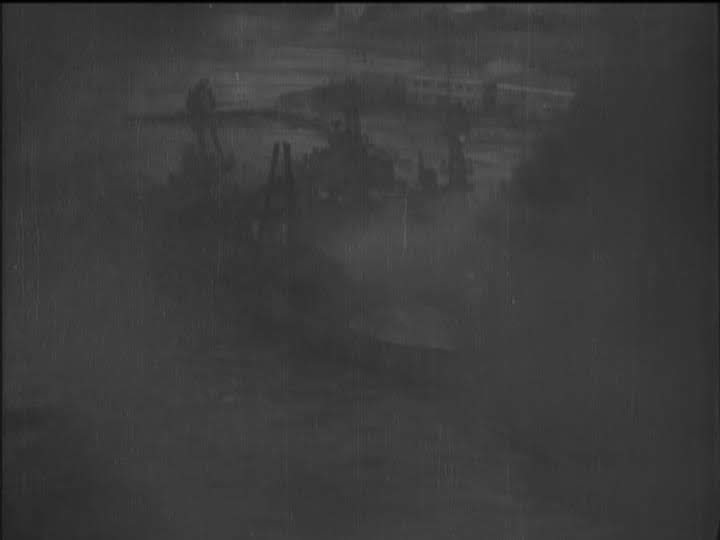 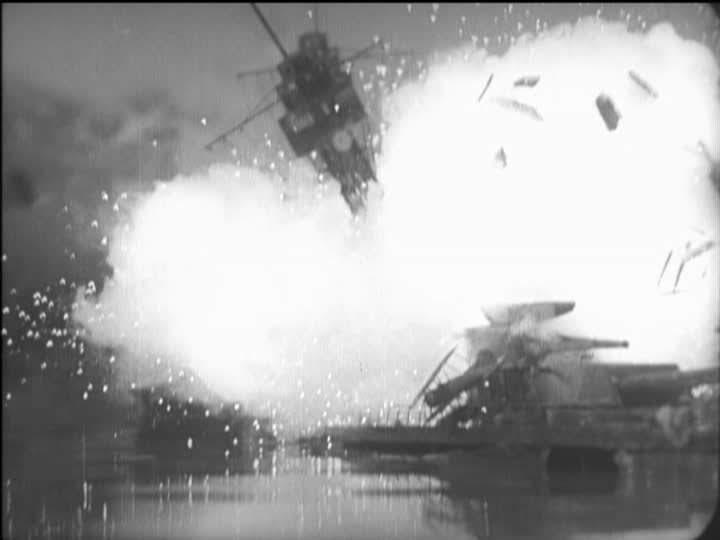 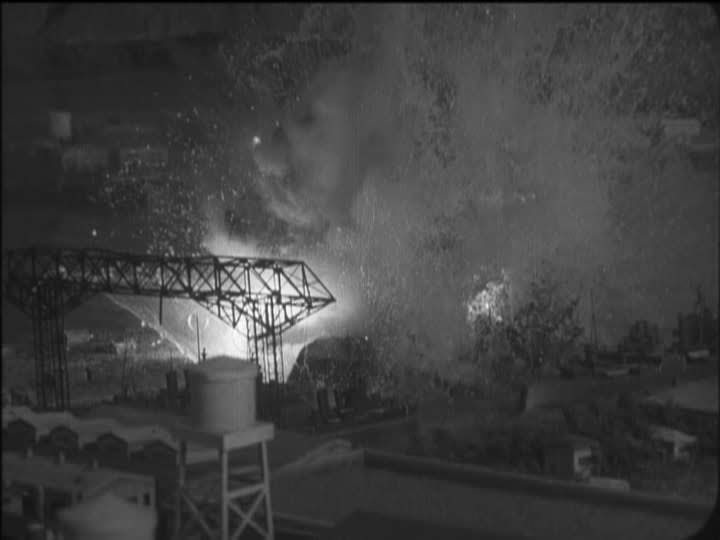 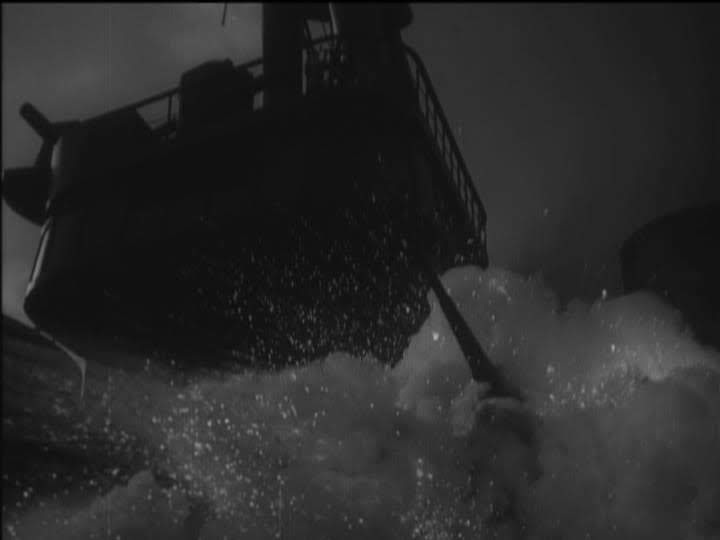 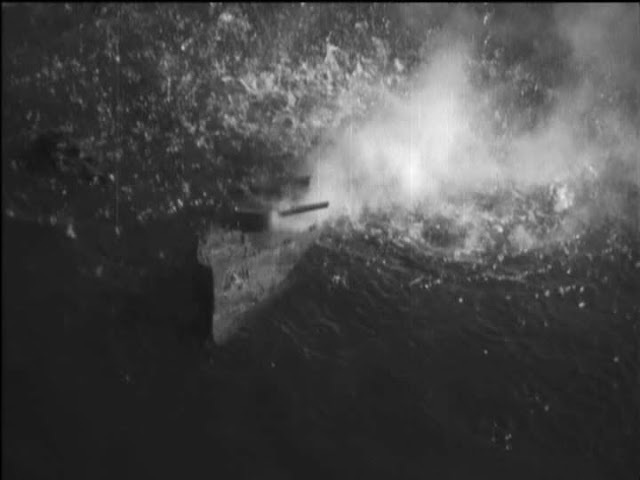 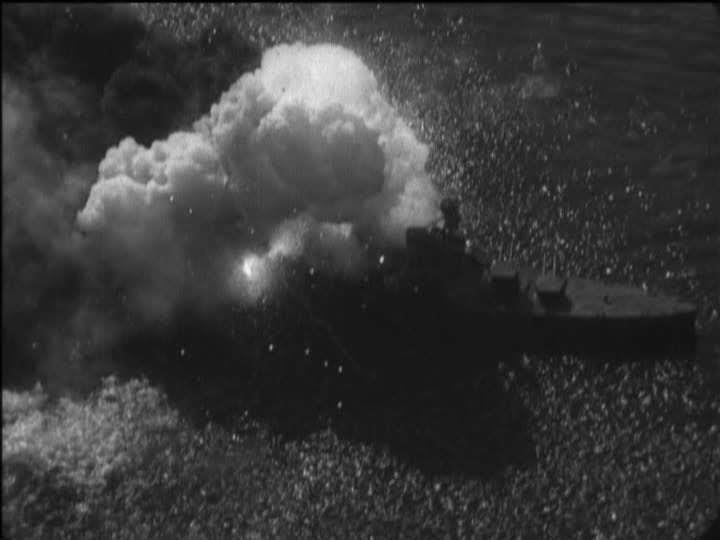 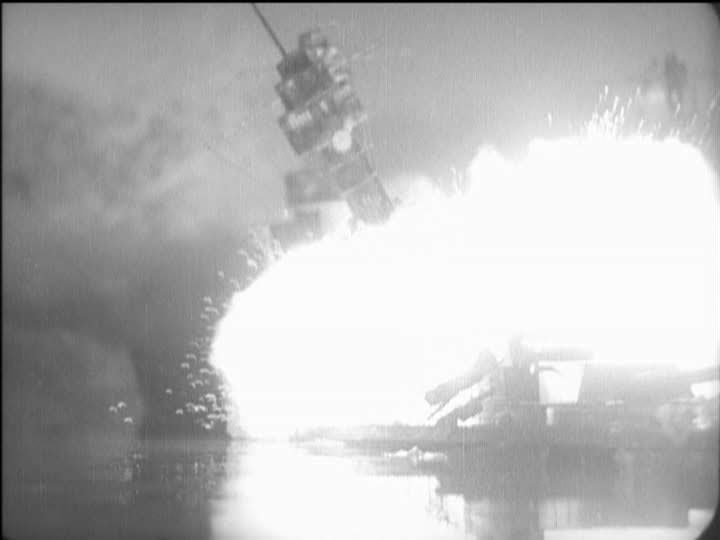 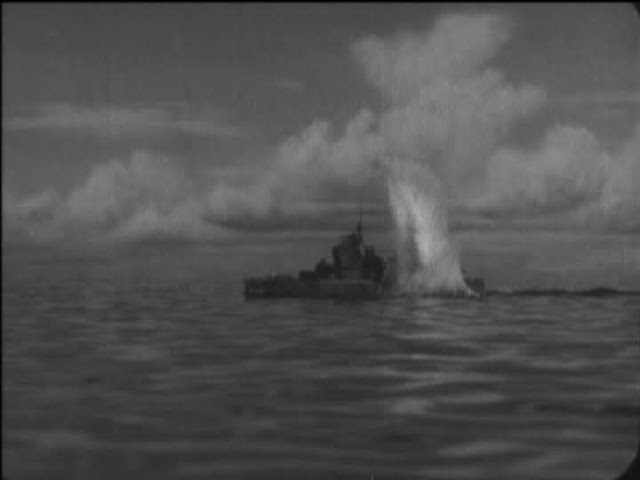 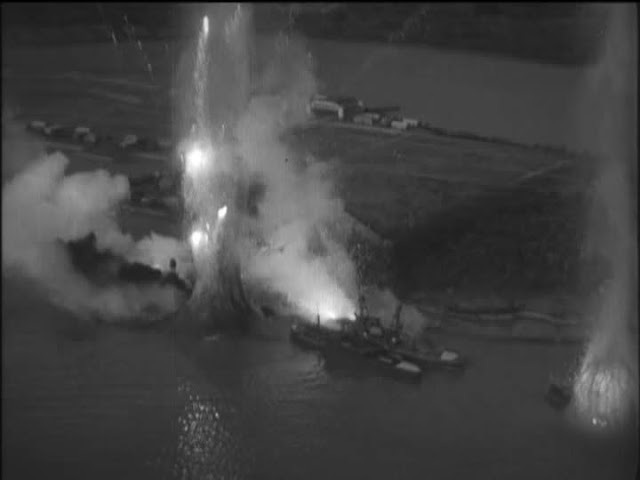 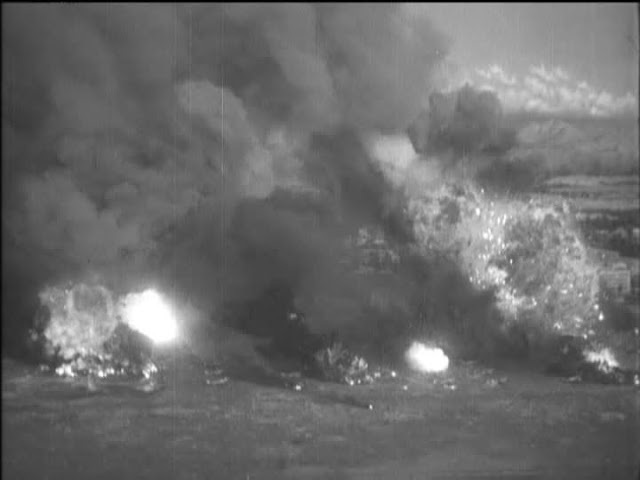 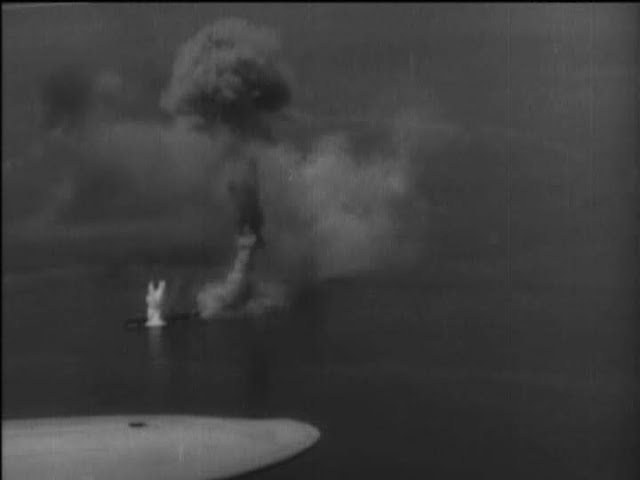 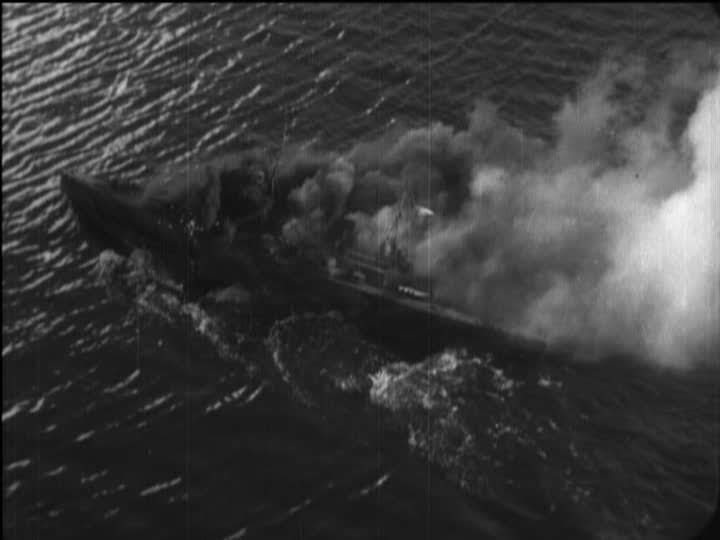 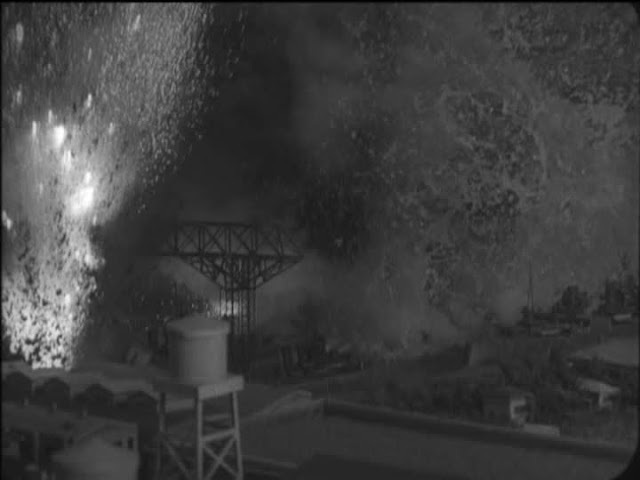 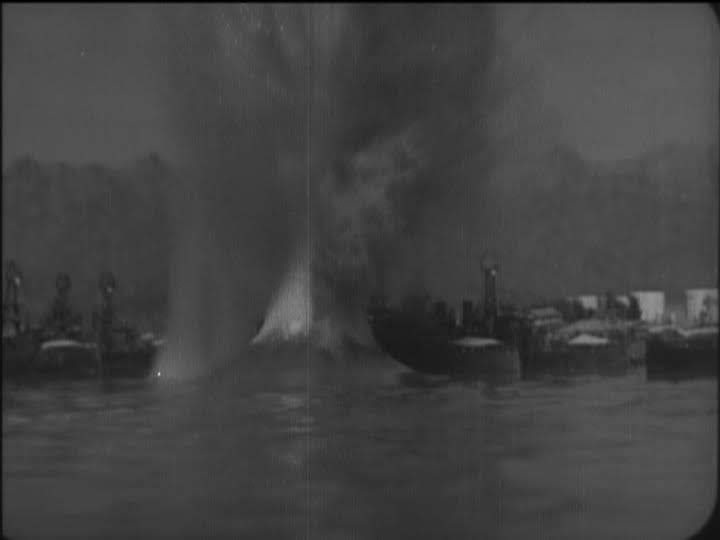 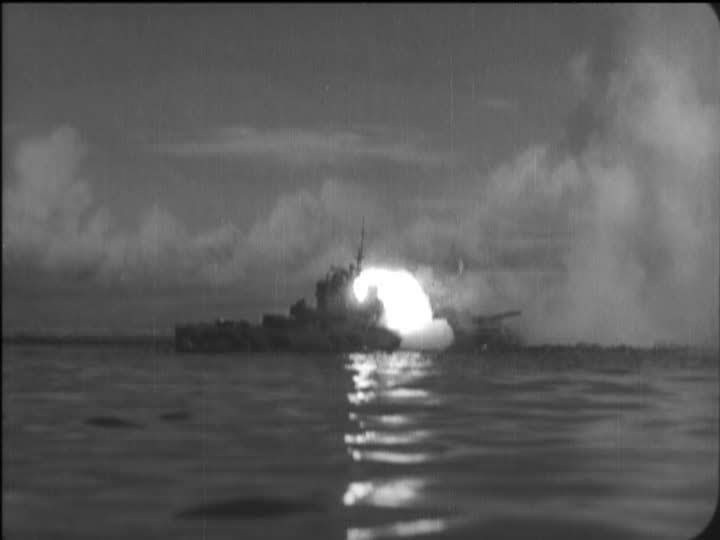 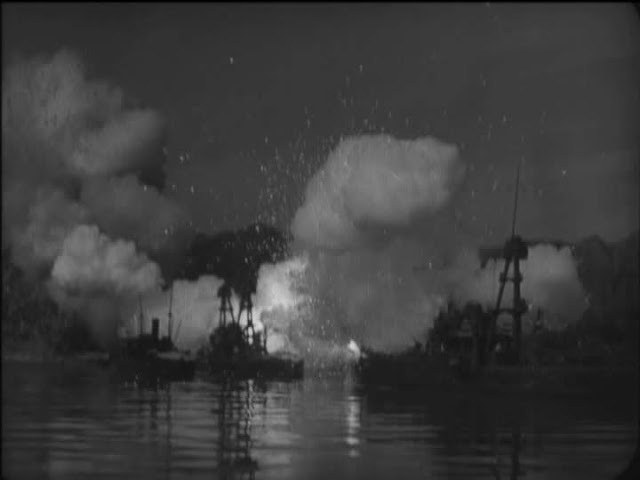 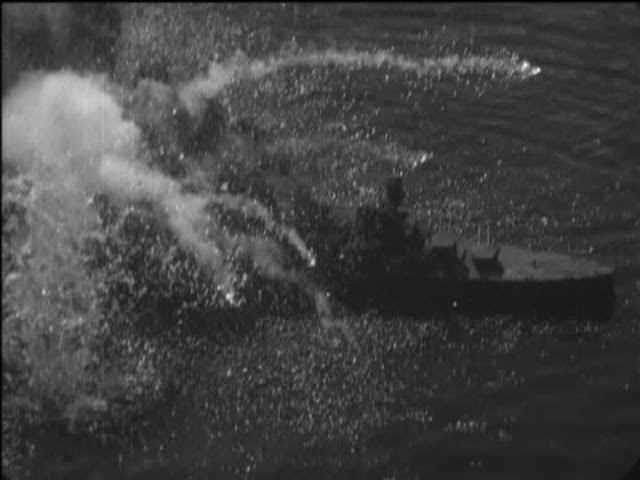 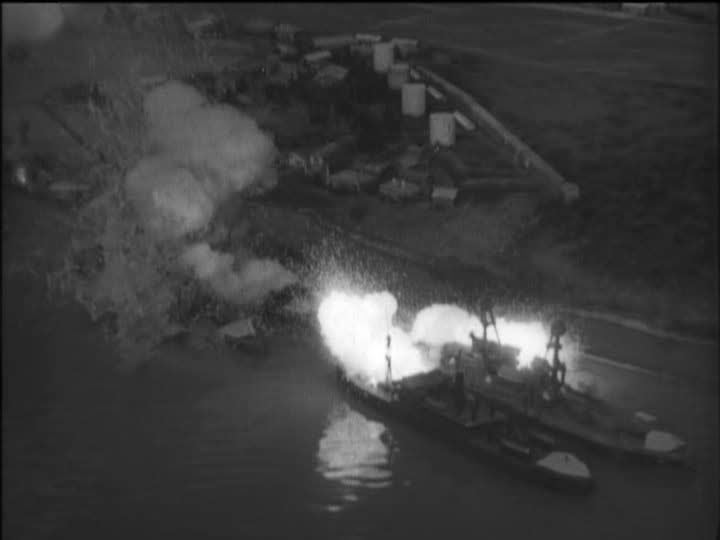 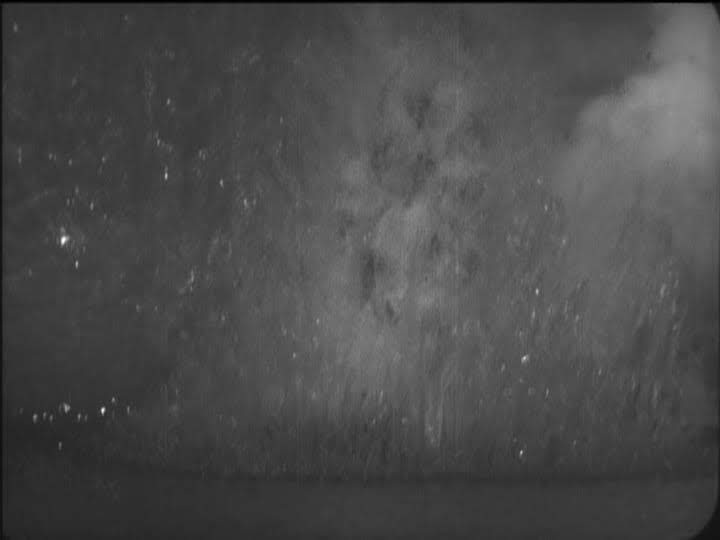 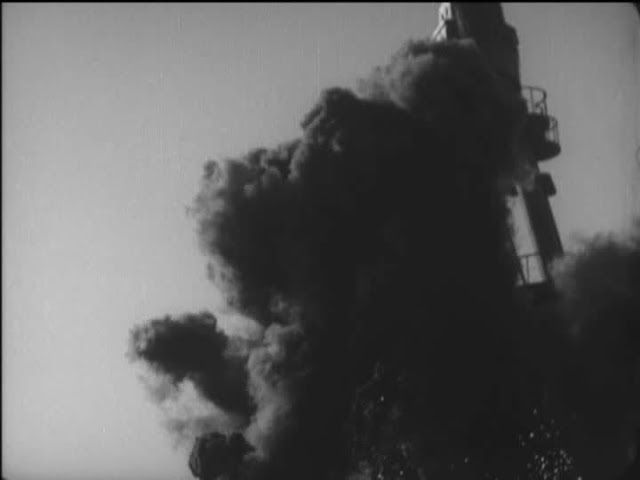 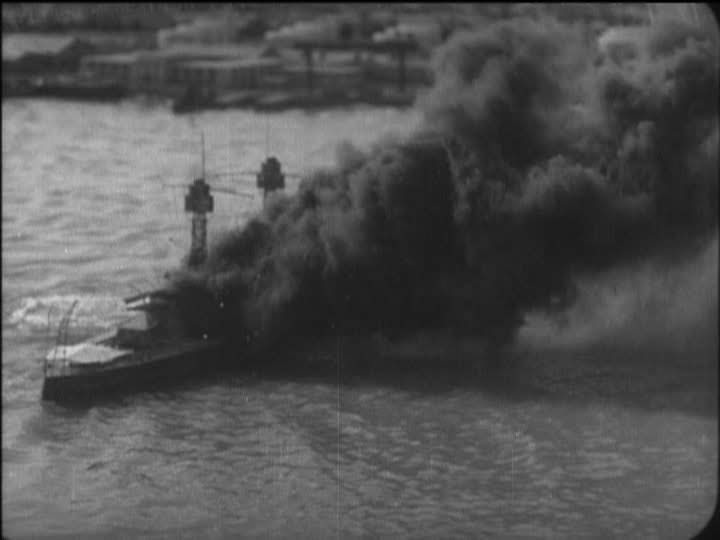 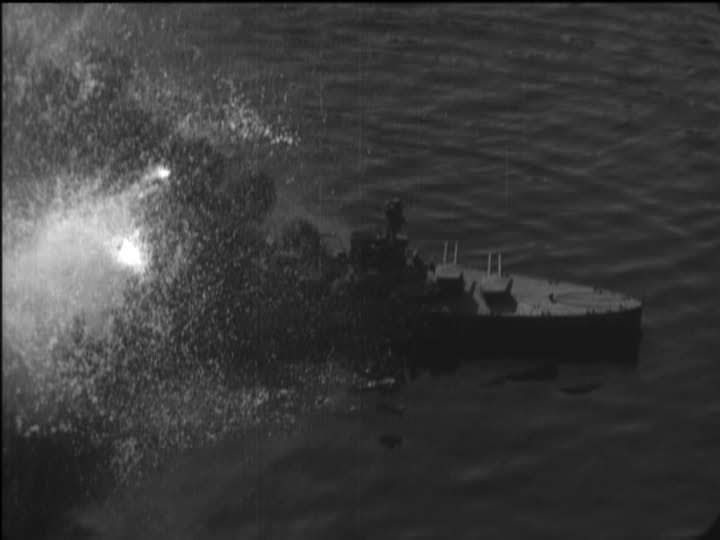 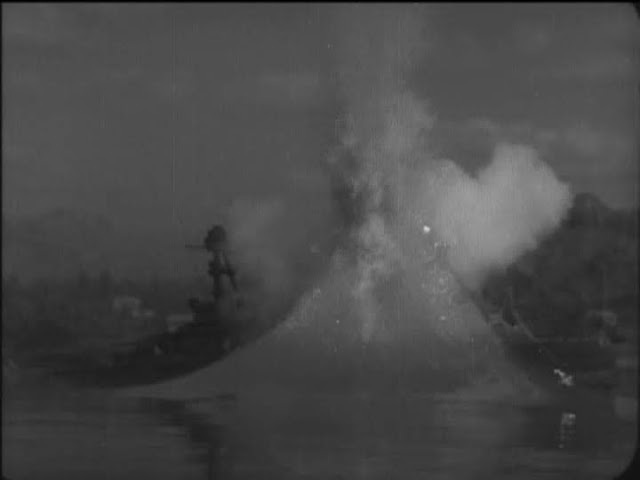 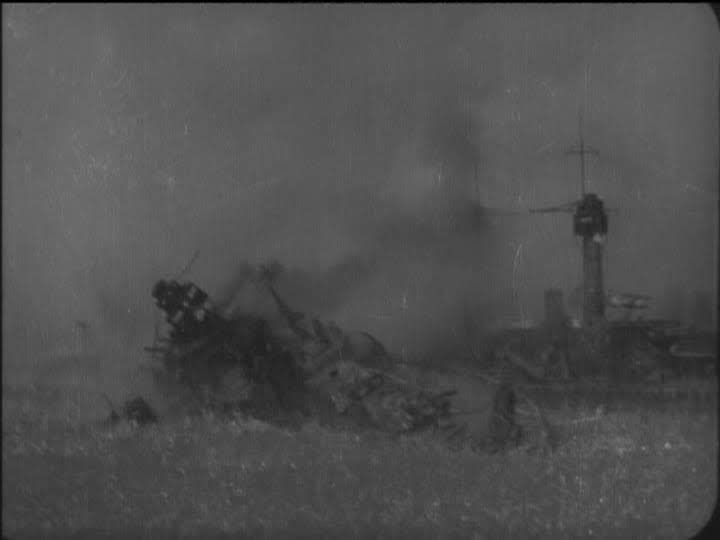 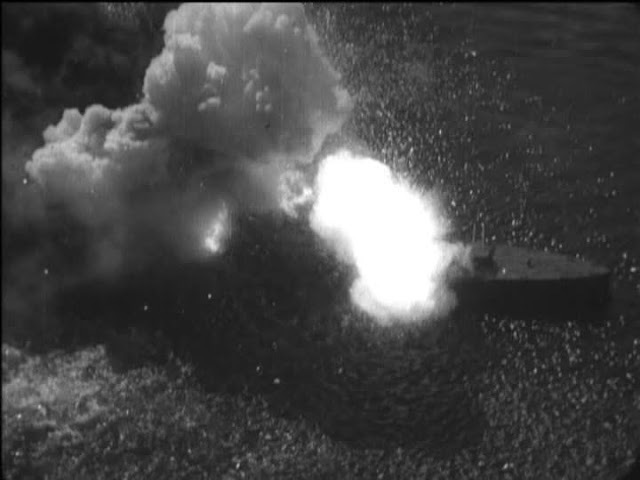 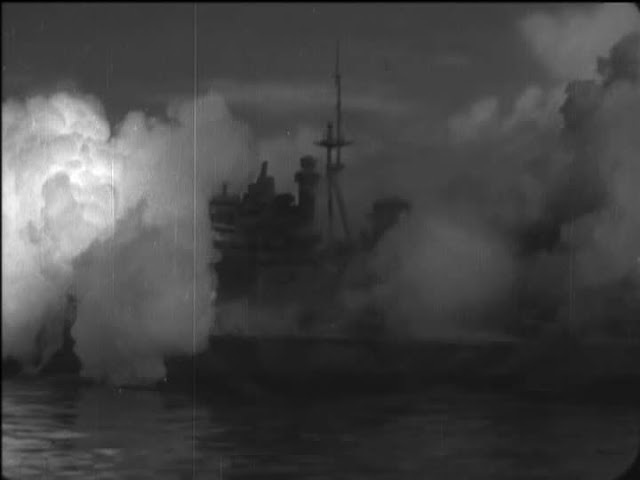 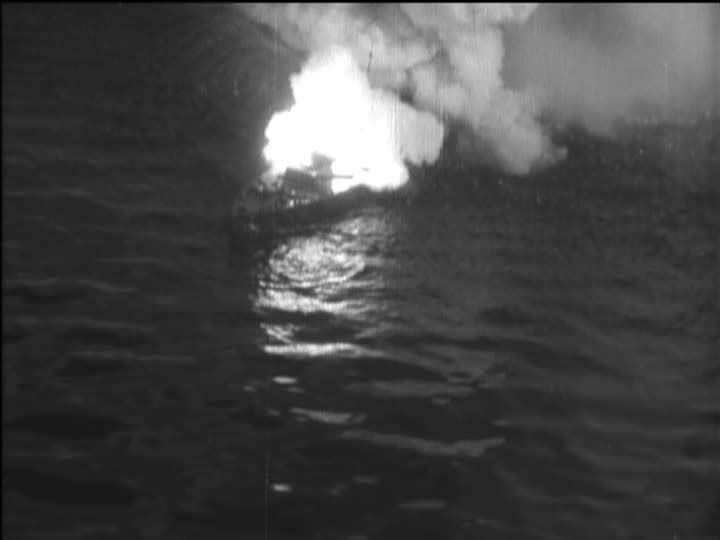 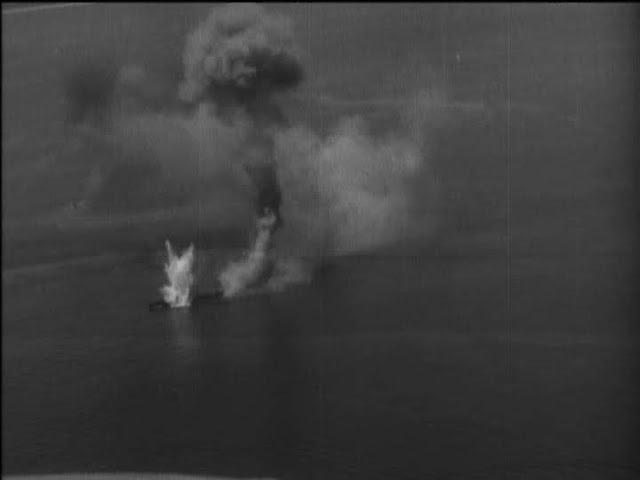 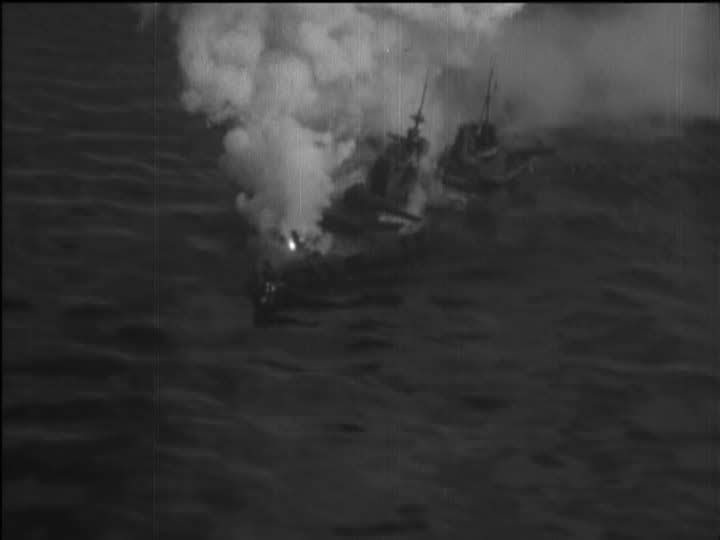 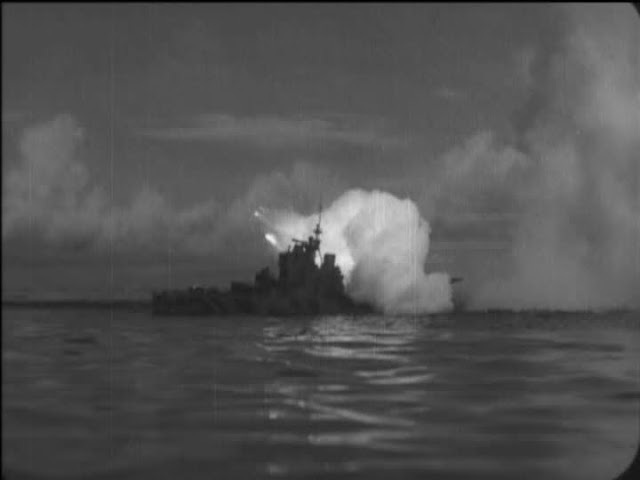 The explosions in the water are less successful as they give away the scale of the ships and water too easily. Thanks are due to Roger Todd for alerting me to this film, for his research and providing the visual material for this post. 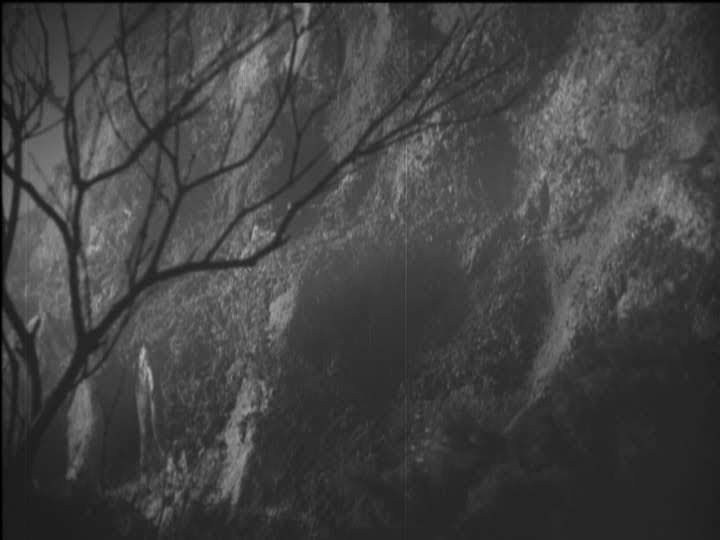 Source: Eiji Tsubaraya: Master of Monsters by August Ragone published by Chronicle Books. 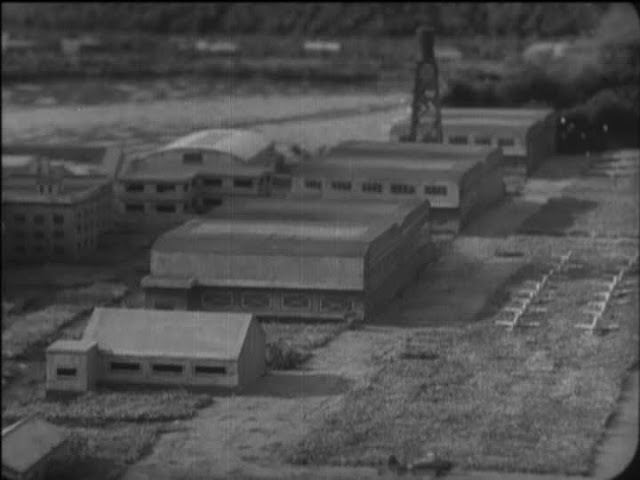 Thanks for highlighting this important miniatures FX film. 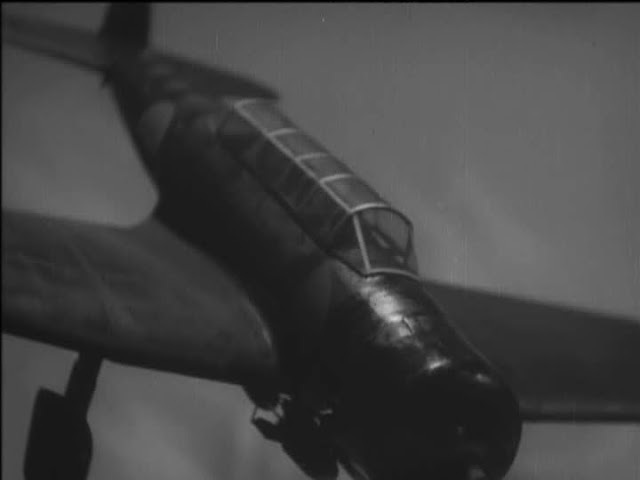 I note that this film is available (in 8 parts) complete on YouTube as in the public domain. 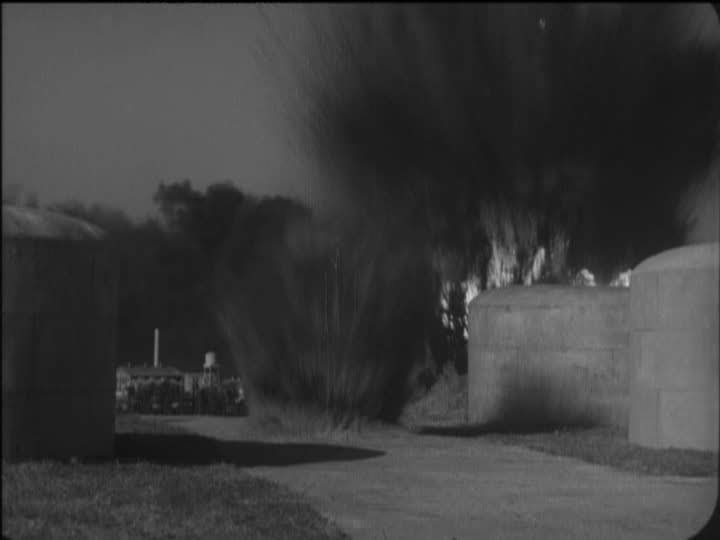 FAB stuff by the way. 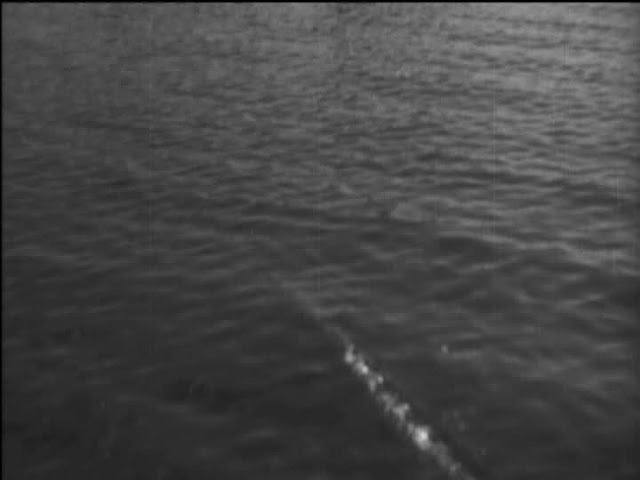 Thanks to all involved for discovering this gem. 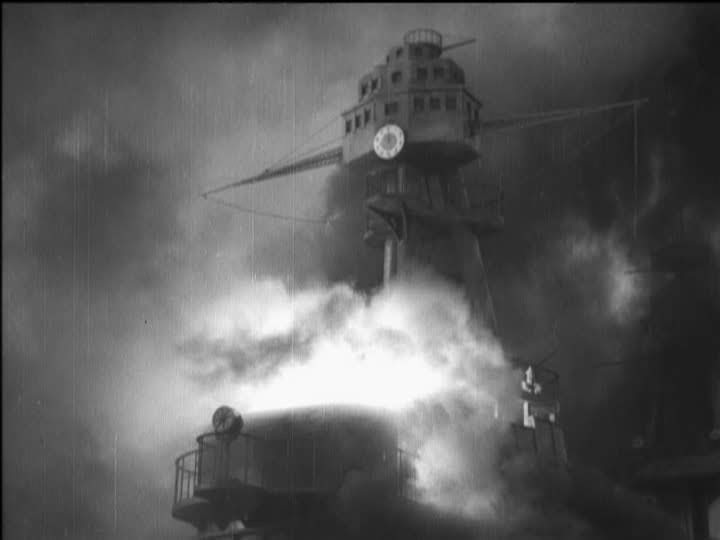 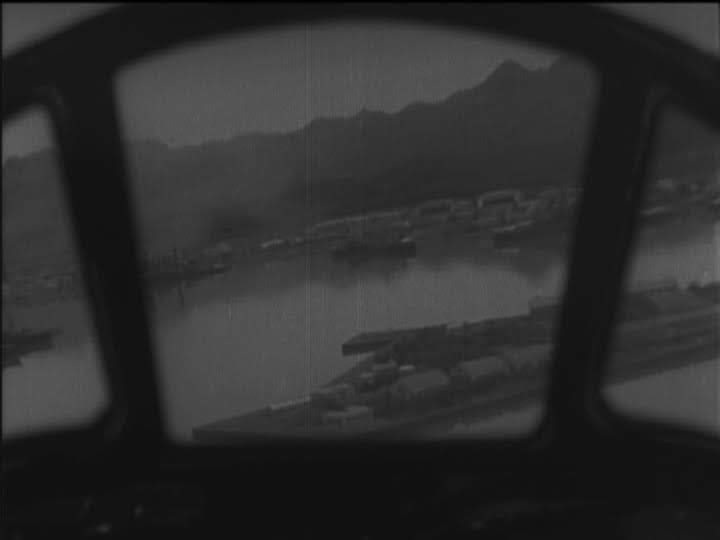 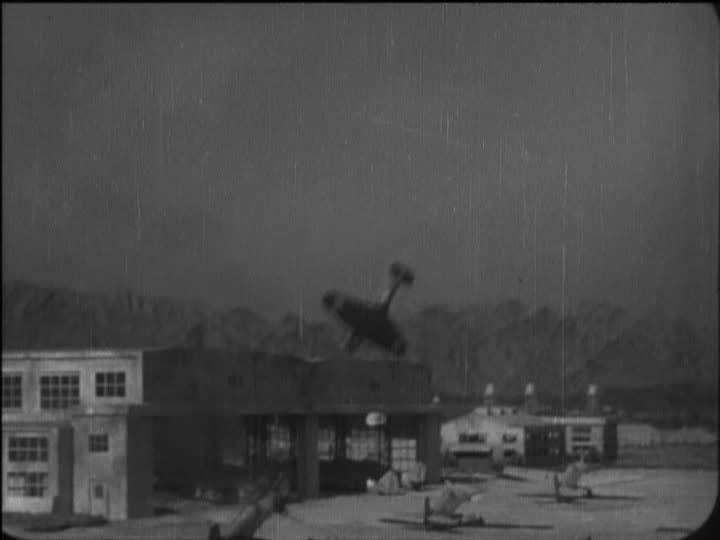 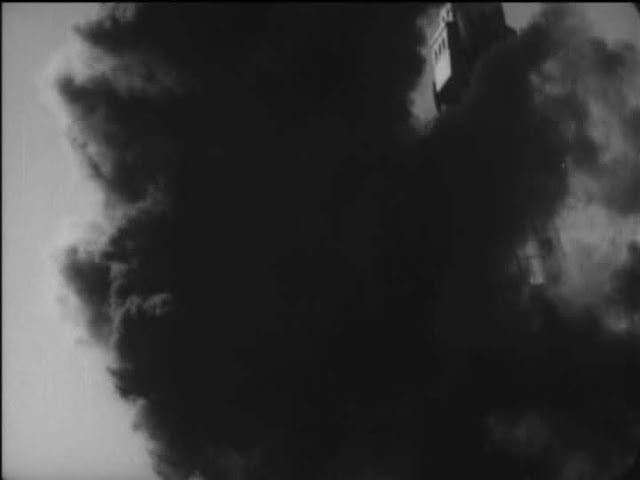 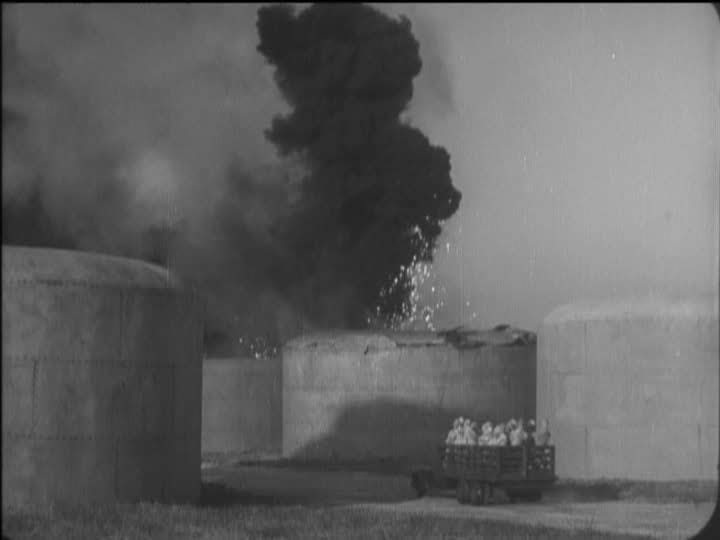 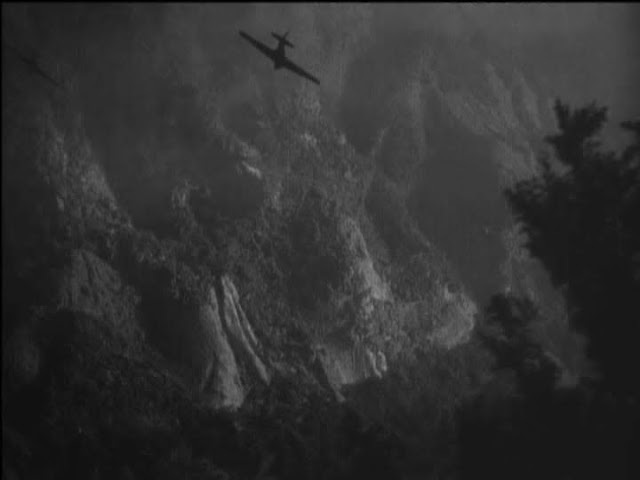 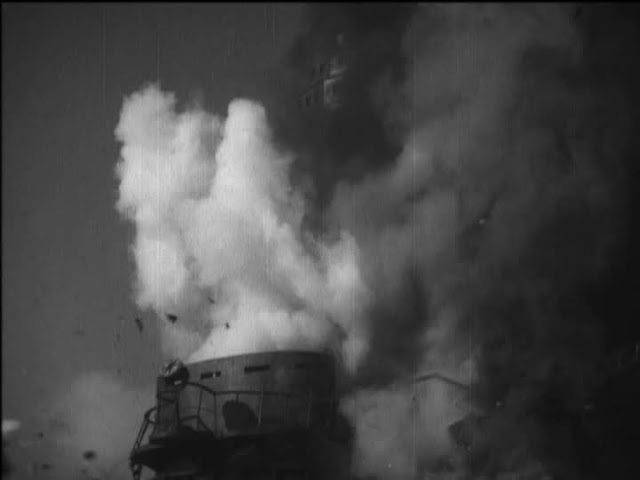 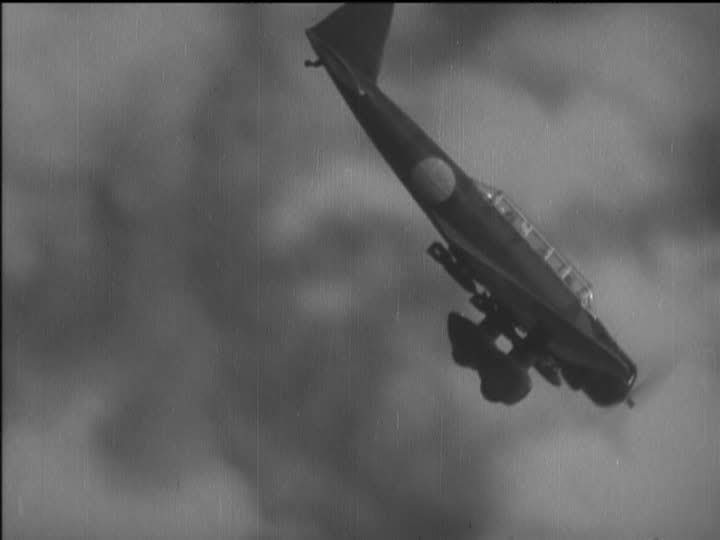 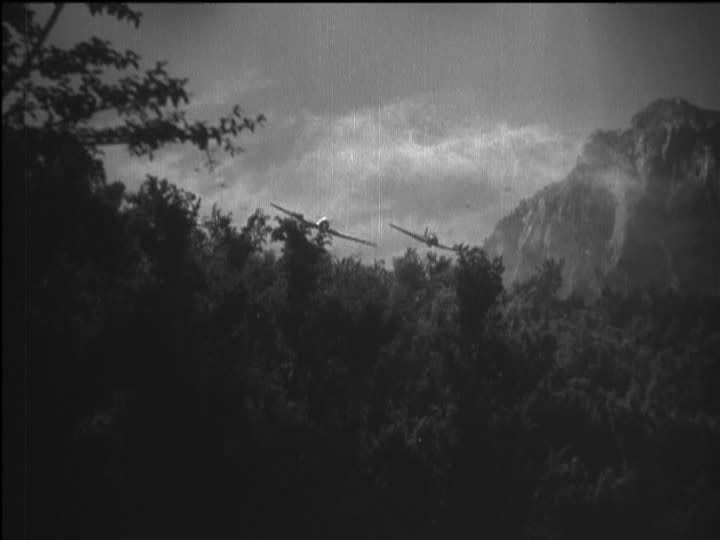 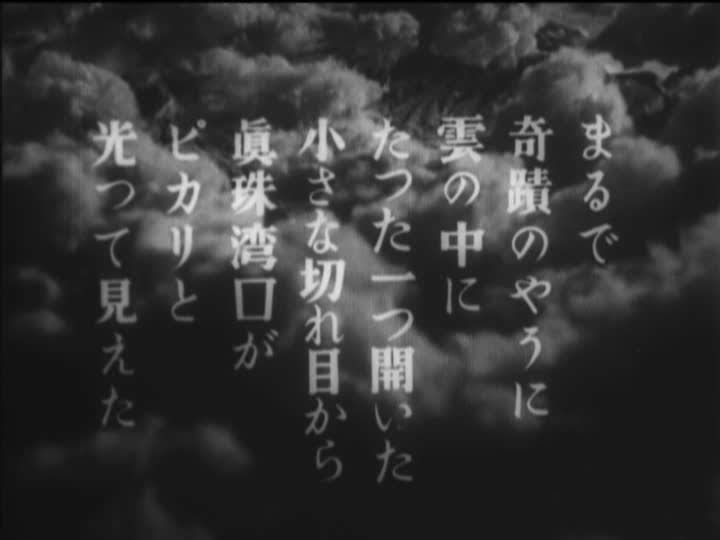 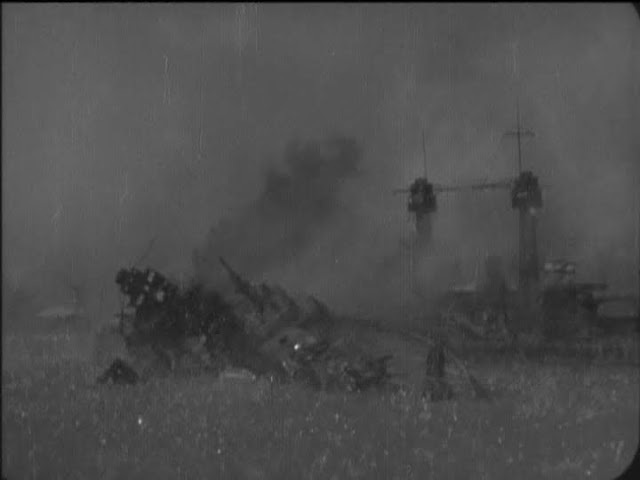 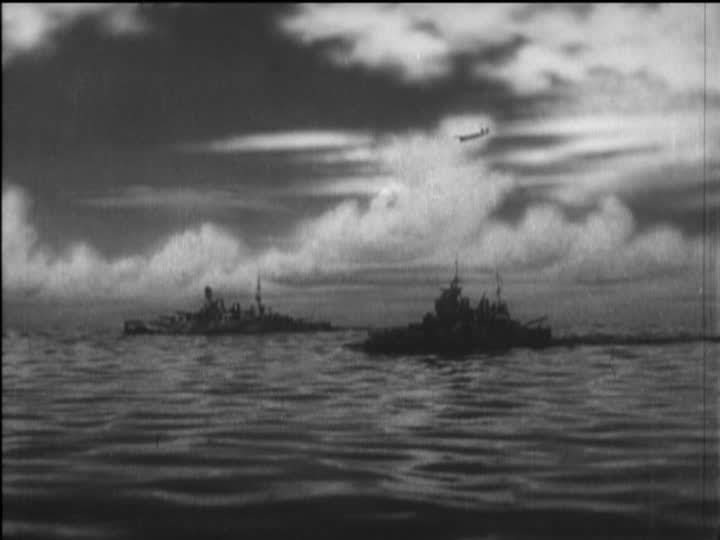 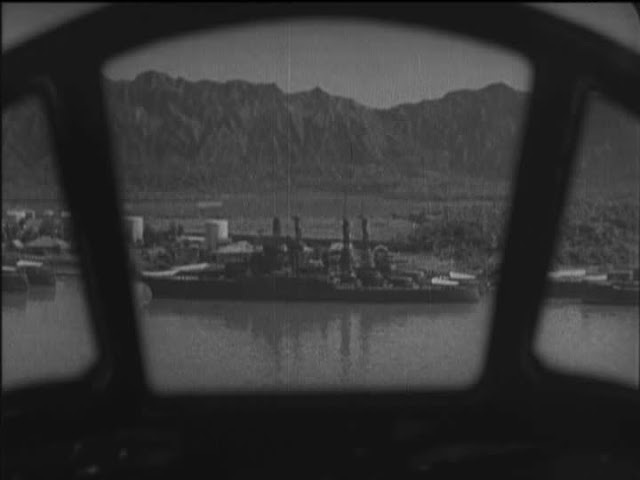 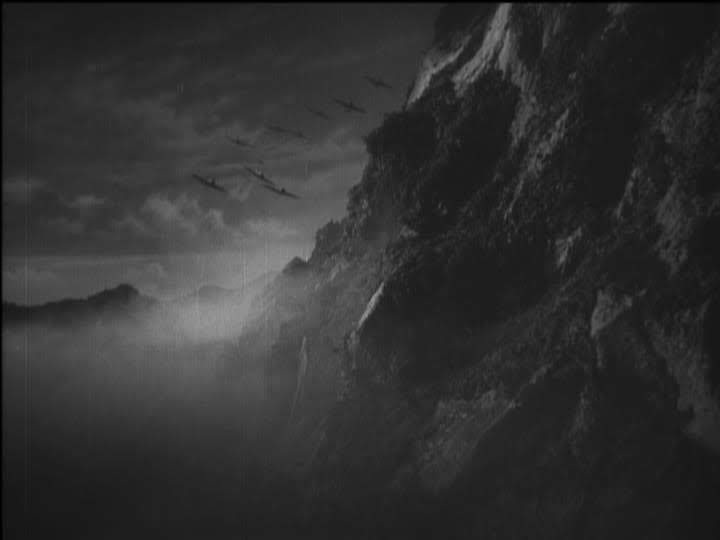 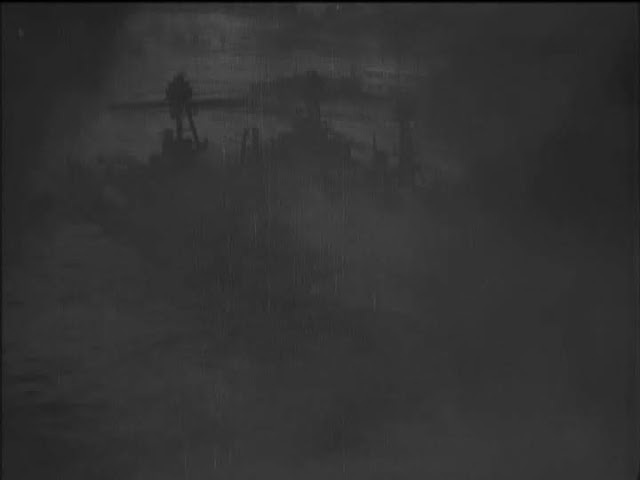 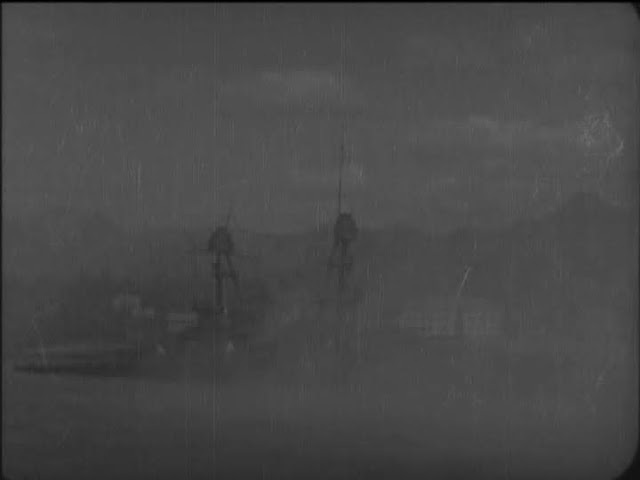 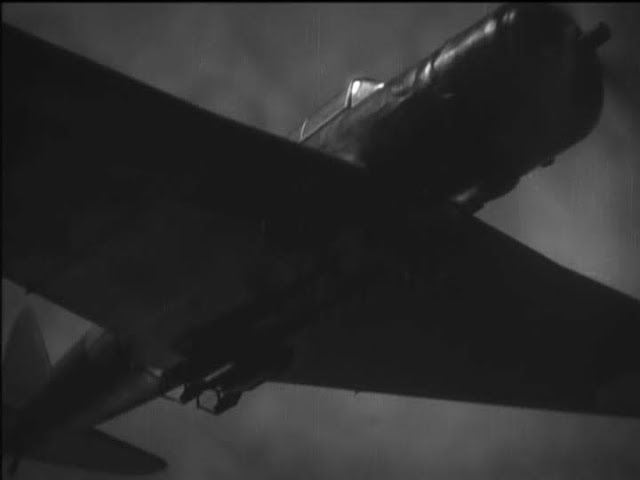 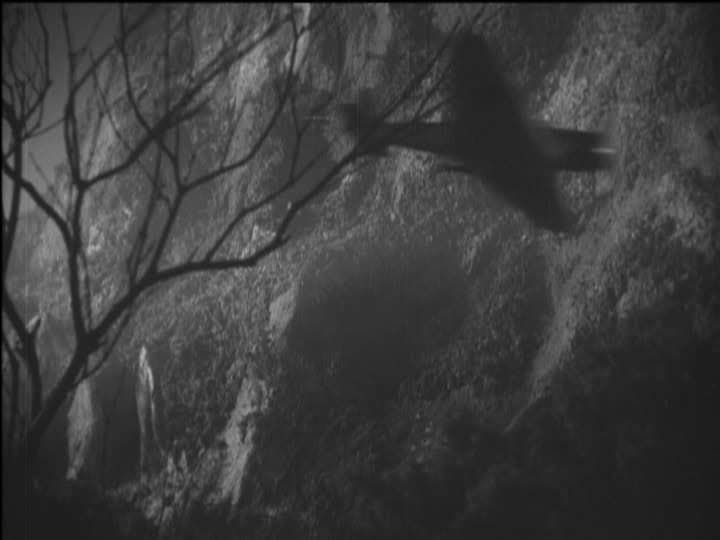 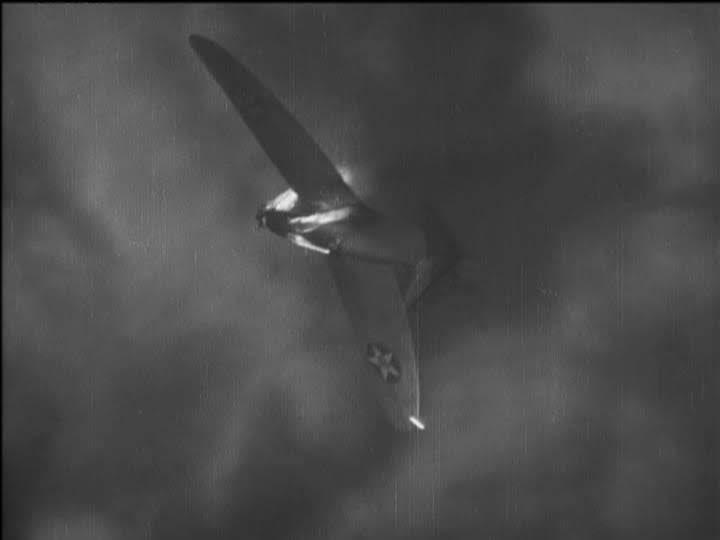 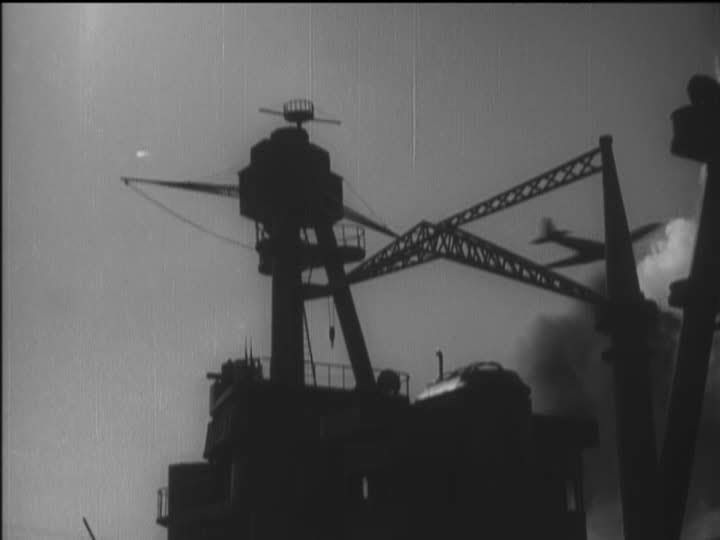 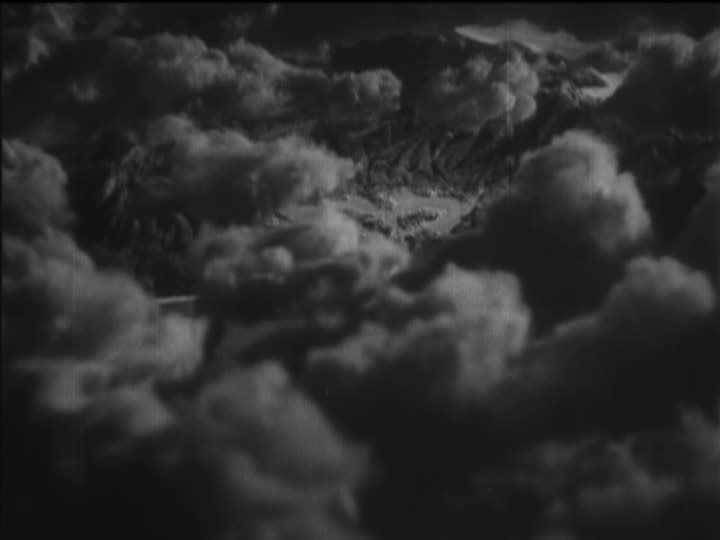 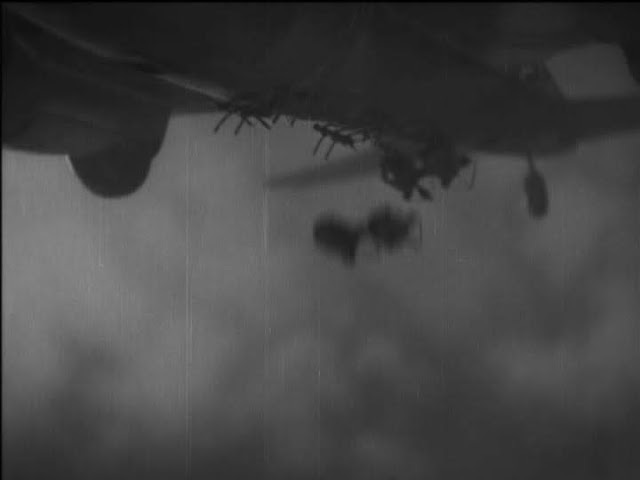 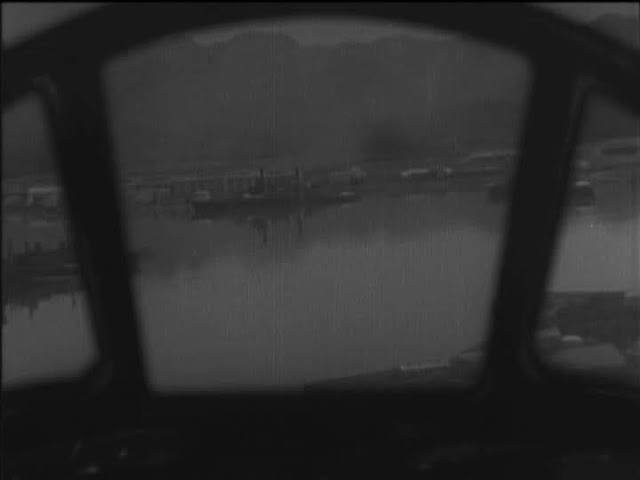 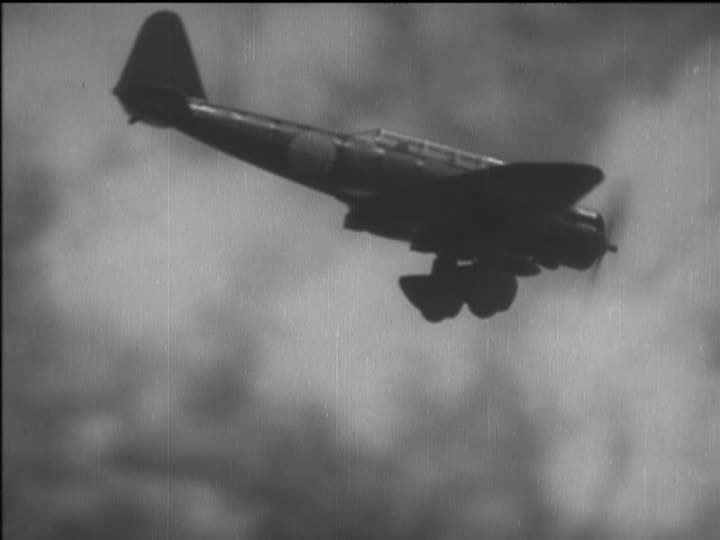 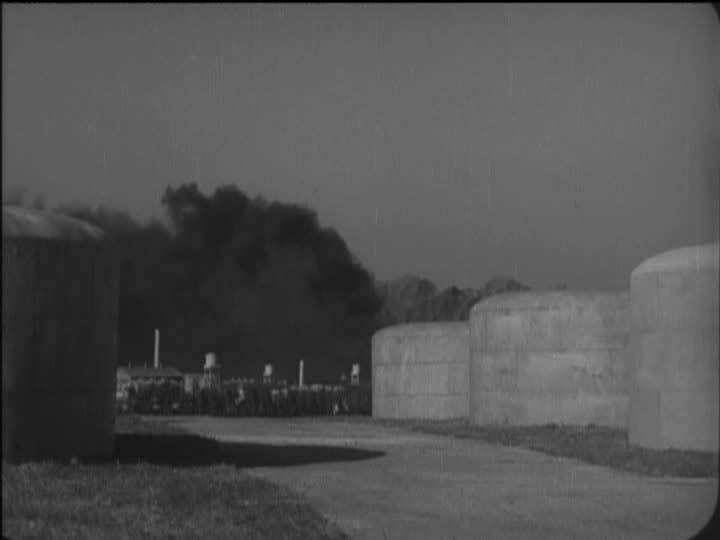 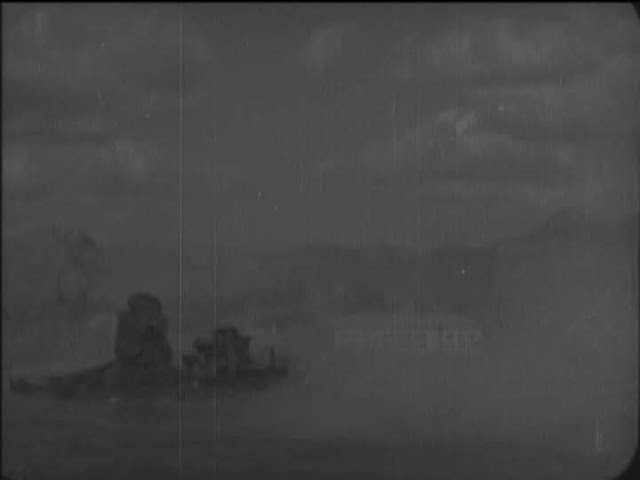 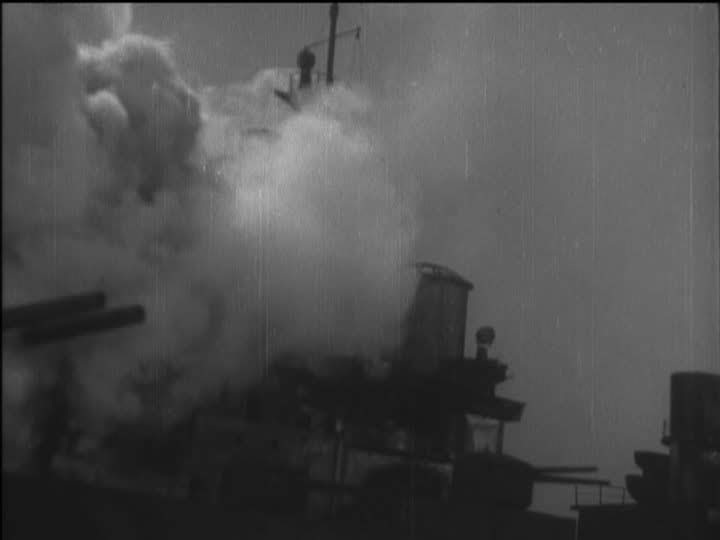 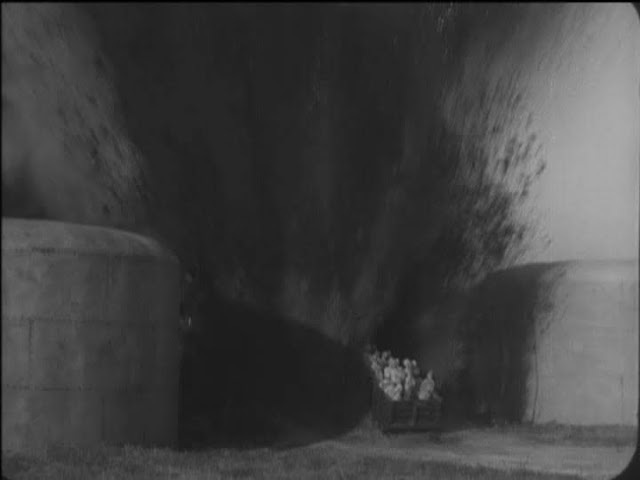 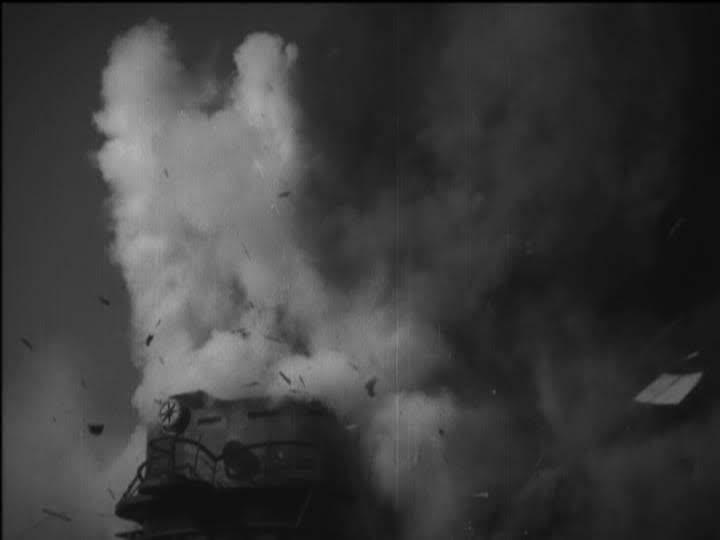 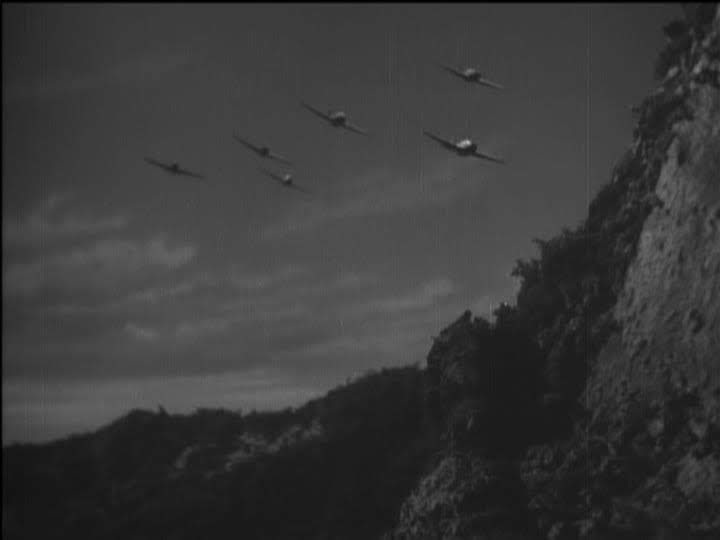 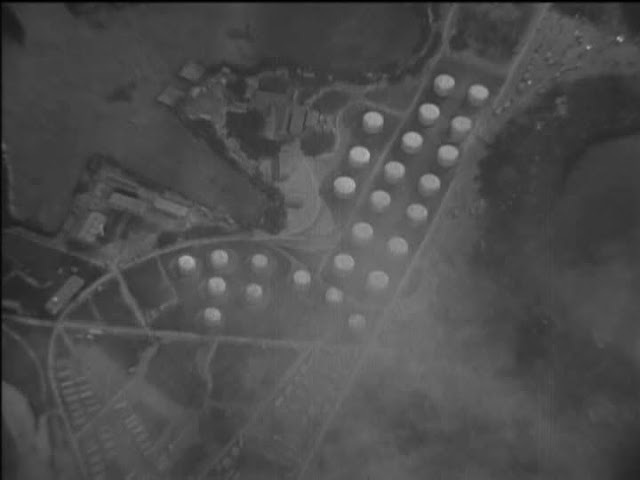 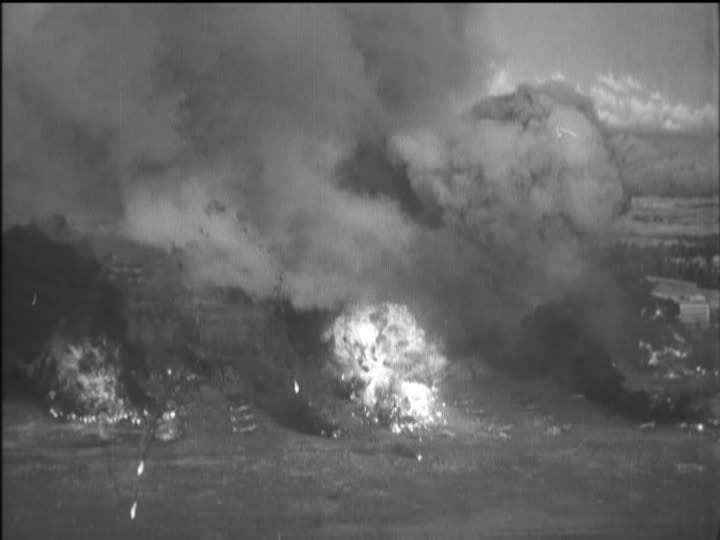 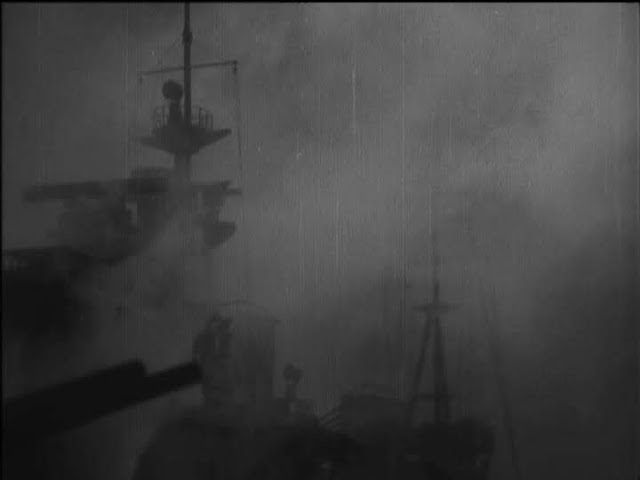 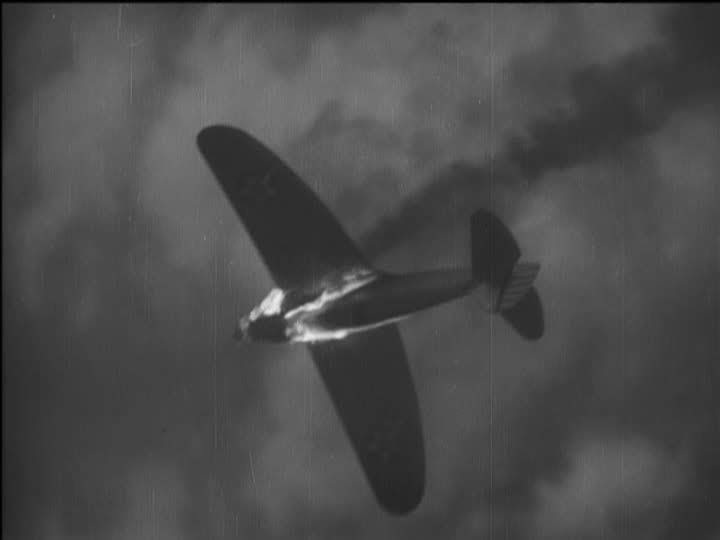 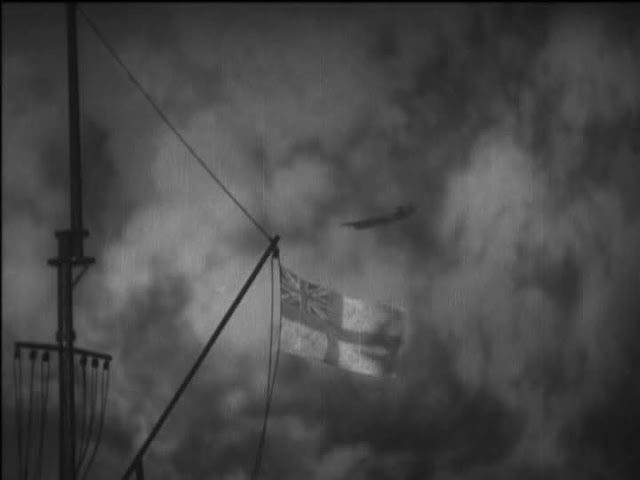 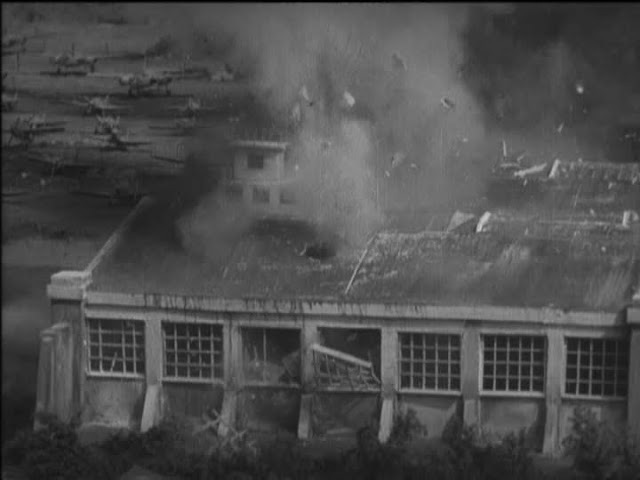 Quite a lot of this film ended up as "stock footage" in various war Documentaries, and stills in books. 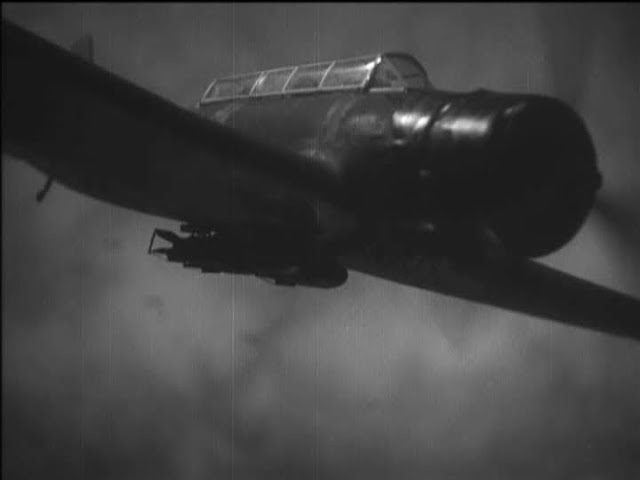 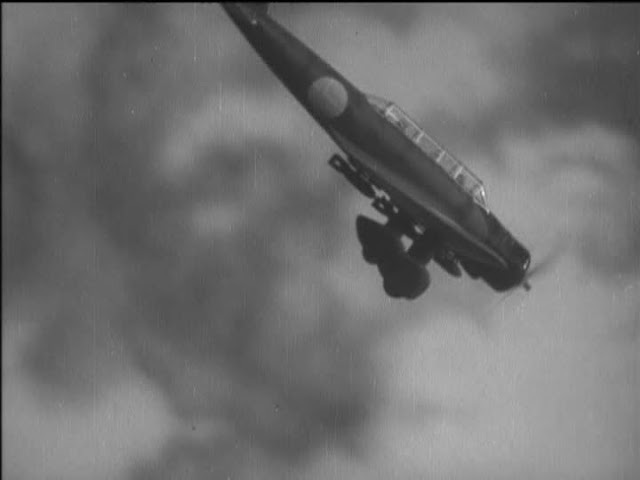 The shot above of the dark colored Aichi D3A (Type 99) Dive Bombers, ended up as still in one of the Pearl harbor Souvenir books i have, and I have seen some of the footage used in Victory At Sea. I have watched the full film on Youtube, and it's slow paced, but picks up quite a bit towards the end, and the Cinematography over all is quite well balanced and composed.